WELCOME TO THE "OTHER TECHNOLOGY" MUSEUM. The museum includes neat older pieces of technology, but not things I actively collect. For now it contains tennis racquets, racquetball racquets, clocks, GPS receivers, audio and video equipment, phones, boats, vacuum cleaners, books and rocks. I've kept or picked up at garage sales several tennis racquets. My dad, Philip P. Martin, Jr., was an avid tennis player since his days on the Norte Dame tennis team in the 1940s, a team which included Chris Evert's father. He continued playing into the 1980s. He got me interested in tennis when I was in my teens and for years we would play on Sundays with my sister and brother in law at the Mission Valley Tennis Club which was just recently torn down. Three of the six racquets in the photograph are "hand me downs" from my dad and upon reflection, I've never have bought a tennis racquet for myself. Since my dad passed away in May 2004 (obituary), it is nice to have these racquets as mementos. Also, as can be seen below, these three racquet models are indeed historically significant and include the first popular steel racquet and the first popular racquet with an oversized head. Tennis racquets show the rapid increase in technology since my childhood. When I was young, the only racquets were wood as represented by the Spalding "Doris Hart" model racquet on the far left which I obtained for free at a garage sale. Doris Hart was a famous women tennis star in the 1950s. I remember my dad had an old wood Wilson "Poncho Gonzalez" model racquet, but unfortunately it was disposed of sometime after steel racquets came out. The racquet second from the left was the first popular steel racquet, the Wilson T2000, introduced in 1967 and purchased by my dad around the same time. 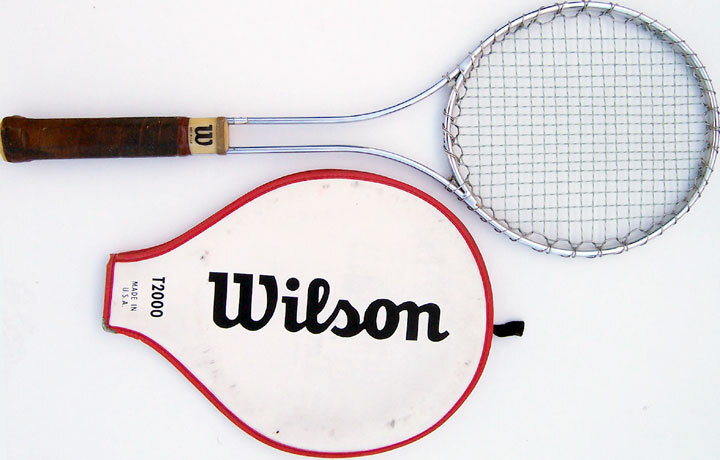 The T2000 was used by tennis star Jimmy Connors. I used this racquet during my teen years after my dad got the Head racquet, third from the left. I would always hit my leg with my follow through serving leaving two little cuts from the steel wire wrapped around the outside of the racquet. The Wilson is still in good condition. The grip was replaced. I purchased another T2000 with cover at an estate sale in February 2006 for $1 in very good condition. The Head is also in good condition, but needs to be restrung. 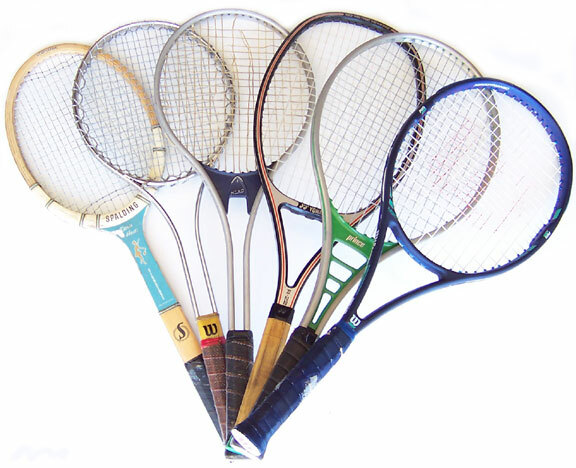 The green racquet, second to the right, is the first popular racquet model with an oversized head, the Prince Classic introduced in 1976, by Howard Head then working for Prince. I saw a Prince like this in the Smithsonian Museum. My father received this as a gift when he retired as an Adjunct Professor of Law at the University of San Diego, and he later gave it to me when he gave up tennis. By the 1980s manufacturers started to use graphite often mixed with other materials. Graphite increased the stiffness of the racquet. The Yonex, third from the right, and the Wilson Graphite Aggressor on the far right, are examples of the use of composite materials. The Yonex was free at a garage sale, and the Wilson was a gift to my wife in the 1990s. 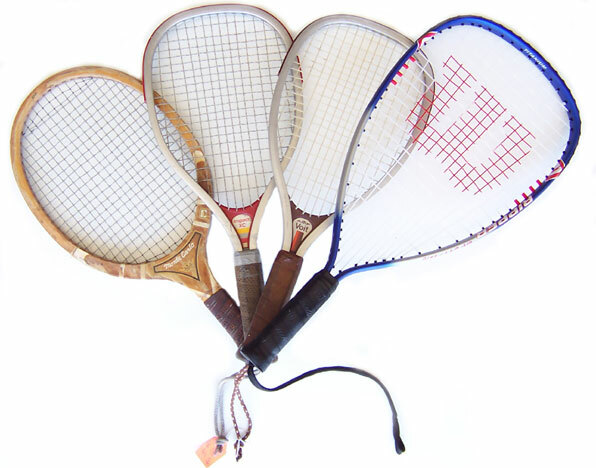 A good discussion of the history of tennis racquets is found at the About site. The link is to the second page which discusses the Wilson T2000 and the Prince Classic. Go to page 1 of the article for a discussion of wood racquets and page 3 for graphite racquets. I use to play racquetball with my brother when I was in eighth grade and high school at the Mission Valley Tennis Club. I started playing again about two years ago and usually play once or twice each week. Racquetball gained popularity in the 1970s. Racquetball racquet technology parallels that of tennis racquet technology with an evolution from wood, to metal, to composite, and to larger heads. The first three examples in the photograph above are free or $1 from a garage sale. The Wilson at the far right is an inexpensive ($15) modern composite racquet with Titanium. 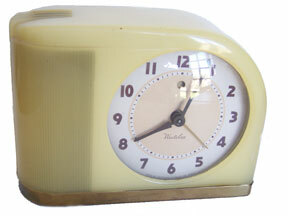 Westclock Electric Alarm Clock, circa 1954, belonged to my parents in law, given to them as a wedding present. I saw the identical model in the Smithsonian Museum. This is an electric clock. "My First Clock," a working pendulum clock you assemble. My First Clock is a good demonstration of how even the simplest clocks are quite a feat of engineering design. According to the site Clock A History, it was not until the 17th century that a practical clock with an accurate minute hand was developed. The basic design of My First Clock would have been cutting edge back then. Our modern life with schedules and appointments would be impossible without accurate clocks. 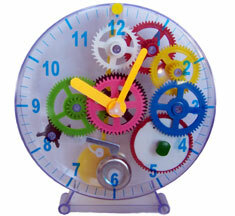 Underlying the design of a simple clock like this is also a huge amount of mathematics. Imagine figuring out for the first time how to translate the movement of the pendulum and gears into the precise keeping of the minutes and hours. Timex Mechanical Watch, circa 1969, my first watch which, similar to watches dating back a century or more, you wound every day or so. I believe I was in sixth grade and received it for Christmas or my birthday. It was reasonably accurate and, thirty five years later, still works. 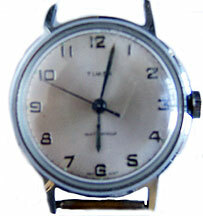 (Of course - its a Timex - "Takes a licking and keeps on ticking.") 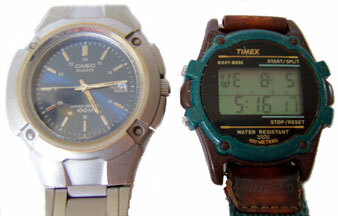 Modern Casio Analog and Timex LCD Quartz Watches, my current analog quartz watch and prior LCD quartz watch, both water resistant to 100 meters. 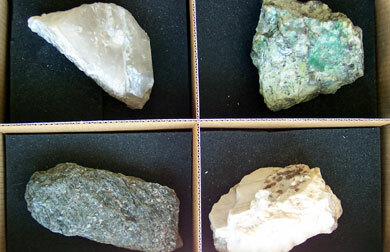 Today, the vast majority of watches and clocks are battery powered and timed by the vibrations of quartz crystals. Quartz watches were not developed until the late 1960s. Even $3 clocks and $10 to $30 watches can keep very accurate time today. The Smithsonian Institution has a fascinating site, The Quartz Watch. Modern Radio Controlled Alarm Clock, resets itself at least once a day from radio signals from the U.S. atomic clock near Boulder, Colorado to the official U.S. time. The U.S. atomic clock is timed by the decay of Cesium atoms and is accurate to .0000001 seconds. This radio controlled alarm clock costs about the same as other alarm clocks at Target and consumes only one watt of power. Go to Time Exhibits at the official U.S. time site for links to other fasinating sites about time history and technology. 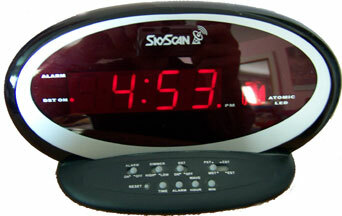 Modern Radio Controlled LCD Quartz Clock, similar in operation to the radio controlled alarm clock, this clock has a large LCD display which consumes a tiny fraction of the energy consumed by a LED display. The clock runs well over a year on two AA batteries. An advantage of an LED display, however, is that it lights up making it visible in the dark. .
Garnin GPS 75, circa 1992, purchased at a garage sale for $2 on May 28, 2005, this global positioning system (gps) device is in excellent cosmetic and working condition. (There is a small chip on the mounting area in back.) 5 days later the same model sold on eBay for $127.50 plus $7.50 shipping! GPS relies on 24 satellites orbiting earth. The receiving device picks up signals from usually at least four of these satellites (satellite reception strength indicator on GPS 75) and then through triangulation pinpoints the position of the receiver on earth giving the latitude and longitude. Think of triangulation this way. Say you know the distances you are from three different cities. You can draw circles on a map with each of those cities as the center with radii equal to the scaled distances. Where the three circles intersect is where you are. It�s a little different with satellites since you use spheres instead of circles. This technology requires artificial satellites which did not begin until the USSR launched Sputnik in October 1957 when I was 5 months old. The idea of GPS was developed by the military in the 1960s and 1970s. It was authorized for civilian use in the 1980s. It was widely used in the early 1990s in Desert Storm and by 1995 all 24 satellites were deployed. Prius GPS. There have been continuous advances in GPS since the early 1990s. 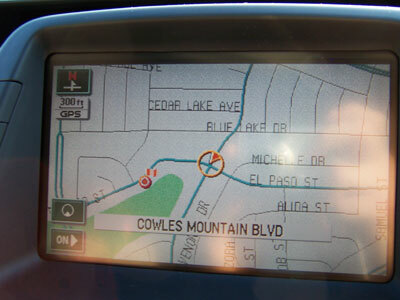 As shown on the display of the 2005 Toyota Prius, many GPS receivers have built in maps pinpointing your instantaneous position on the map. The Prius GPS even talks to you! Many receivers today connect to computers allowing you to download updated maps. Many also have a color display. The accuracy has also increased. 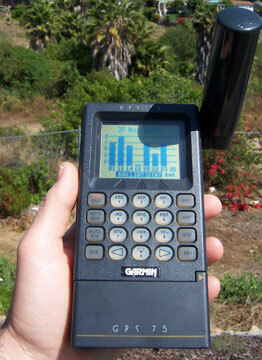 The GPS 75 above was accurate to 15 meters subject to accuracy degradation to 100m under Department of Defense restrictions. Today the restrictions have been removed. With Wide Area Augmentation System (WASS) receivers, accuracy is possible to three meters in North America. In other words with a small handheld device you can know exactly where you are within three meters, about ten feet. Small devices can now be purchased for less than $100. GPS has transformed navigation methods for surveyors, farmers, sailors, hikers, travelers and others. More information can be obtained from these sites: Garnin, How Stuff Works, Univ. of Colorado Geography, Trimble, Rand . 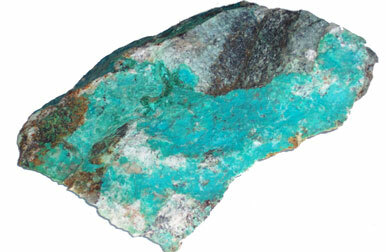 Irons go back to at least 1st Century China where pans of hot water were used to remove wrinkles from fabric. (See Wikipedia - Irons.) According to Wikipedia, Ironing, the heat in irons loosens the bonds in the long chain molecules of fabric. The weight of the iron straightened the fibers. As the fabric cools, the fibers remain straight. My small collection shows several approaches to supplying the heat. The first iron is a charcoal iron. Hot charcoal is put into the body of the iron. The second and third irons are flat irons. They are heated on a stove or fire and then used to iron the clothes. As they cool, you have to put the iron back on the stove or fire. You would use at least two irons so that one was always hot. While flat irons go back to the Middle Ages, these two with detachable handles, are from after 1870, the year detachable handles were first patented in United States. (Old and Interesting, The History of Ironing.) 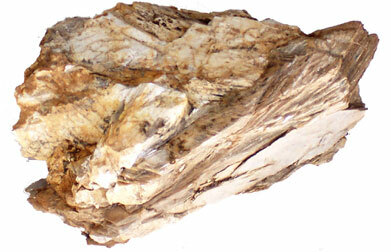 By the early 1900s asbestos was used in some flat irons like iron No. 2 to insulate the iron core. This kept the iron hotter longer and directed the heat down to the fabric and not up to the person ironing. By the 1970s, however, people came to realize that friable asbestos poses a health hazard if inhaled. Iron 4 is a gasoline powered iron from Montgomery Ward. It has a December 1936 patent date. The site Irons and Ironing Boards indicates they talked to a woman who used one all the time. She ironed by the back door. When the iron caught fire, which happened several times, she would throw it out the door! You use the built in pump to create pressure like with a gasoline lantern or gasoline camping stove. I question the safety of using a gasoline appliance inside. Not only is there a fire danger, but also a danger of carbon monoxide poisoning. I'm using mine for display purposes only! Irons 1 through 4 were purchased at an estate sale in the summer of 2011 for about $5 to $10 each. Irons 5 and 6 are electric irons from around the 1940s or 1950s. The electic iron was invented in 1882 by Henry Seeley. (Wikipedia, Ironing.) As can be seen above, other heat sources continued to be used well into the 20th century since electricity was not available in many areas. Charcoal irons are still used today in some areas of the world that don't have reliable electricity. Iron No. 5 is a General Electric travel iron that was given to me by a student in June 2011. (Thank you!) It comes with the original box. General Electric formerly made a variety of small consumer electrical appliances in the United States. While General Electric is still a large company, their business now is in jet engines, large medical equipment, steam and gas turbines for energy production, finance, and large home kitchen and laundry appliances. No. 6 is a Sunbeam iron that belonged to my mother in law. The Black and Decker iron at the right (no. 7) is our present iron. I think it was purchased new in the early 2000s for perhaps $10. It was made in China. All the other irons were made in the United States. 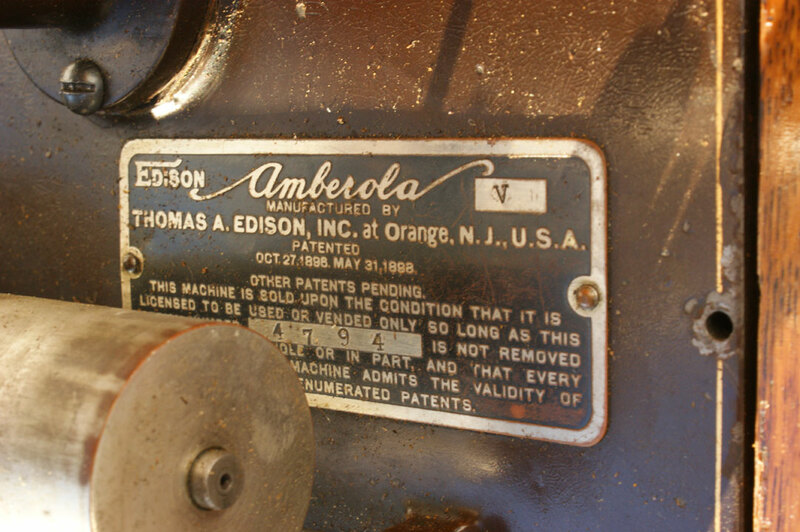 Edison Amberola Model V (Large Image, Closed, Machine Close-Up, with cover over gears removed, Label, Before 1, Before 2, Before 3) (Introduced 1913) Thomas Edison is credited with producing the phonograph in 1877. Edison's device used cylinders - originally made out of tin and later out of wax. As explained below, by the late 1890s the Gramophone was introduced by Emile Berliner. The Gramophone used flat disks. By 1901 Gramophone was taken over by Victor. 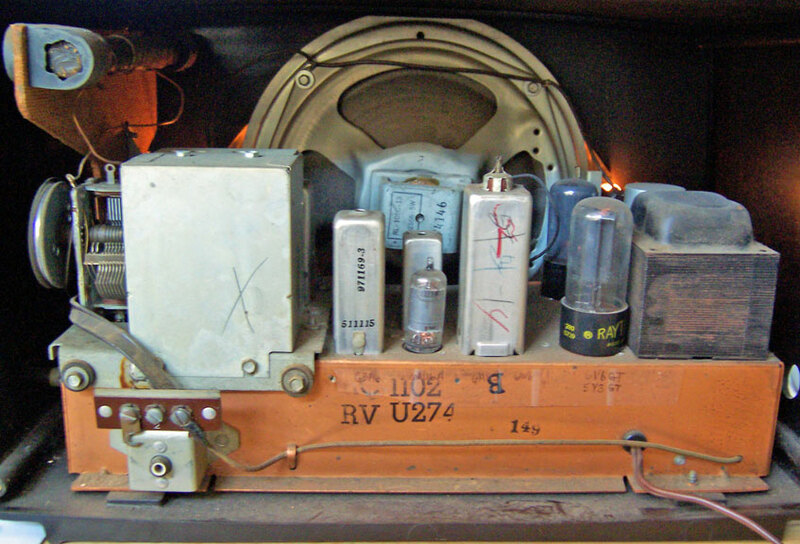 Victor eventually became RCA-Victor. The flat disks eventually became more popular, but Edison continued using cylinders. 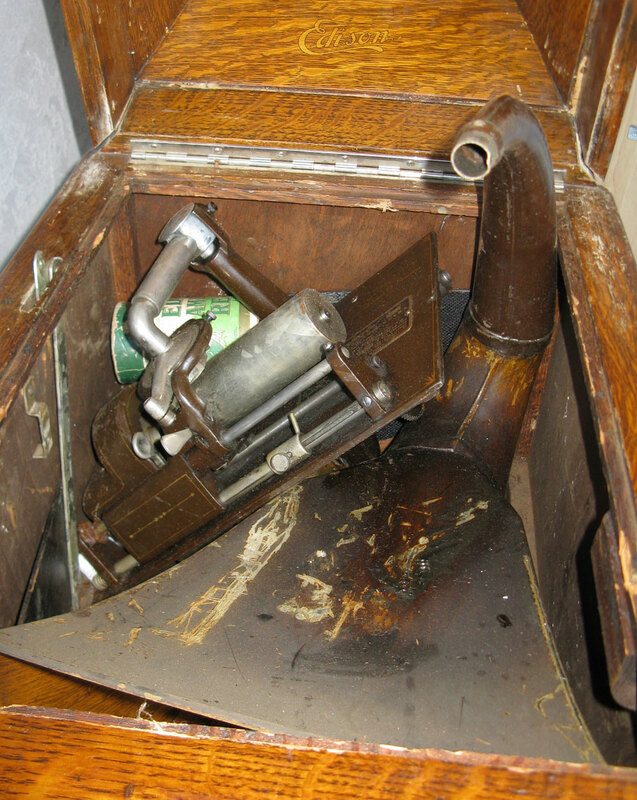 As explained at Intertique - Edison Internal Horn Phonographs, the Amberola Models, Victor by 1906 had another innovation of sorts offering machines with an internal horn instead of an external horn. This really didn't improve sound quality, but it become fashionable. The Victor machines were called Victorola. By 1909 Edison introduced his internal horn machine, the Amberola. By that time the "-ola" suffix had become synonymous with an internal horn machine. (Id.) There was an Amberola series with Roman numerals and a later 30-50-75 series. The later series was more budget based. My machine is an Amberola Model V. Intertique - Edison Internal Horn Phonographs, the Amberola Models describes it as a "Mid-sized table top machine with beveled corners. Unique motor with flywheel on mandrel shaft. Diamond B reproducer." It has a red oak cabinet. The larger pieces have red oak veneer over some other wood. The machine is similar to the external horn models, except the horn curves downwards into the cabinet. The front of the horn appears in front of the cabinet behind an oak grate and underneath the machine itself. I'm guessing the horn is tin. It is painted brown and made to resemble the oak wood. 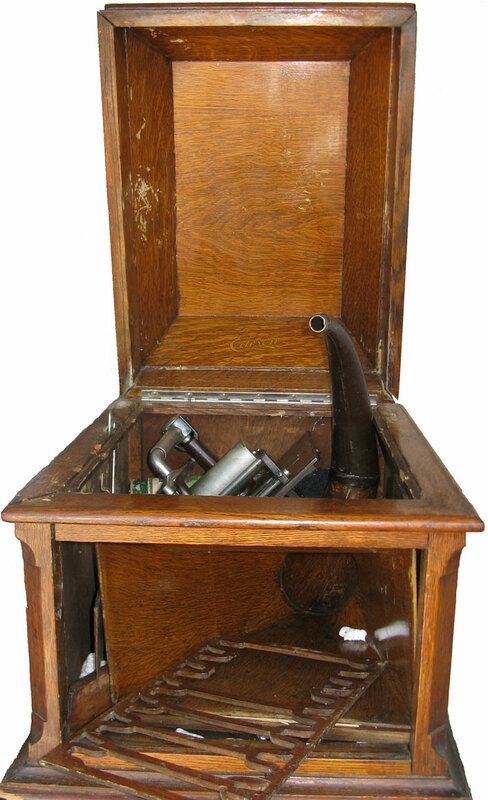 As you open the lid to the cabinet, the horn is covered in the back by a black piece of hardboard. I think mine is a modern replacement. 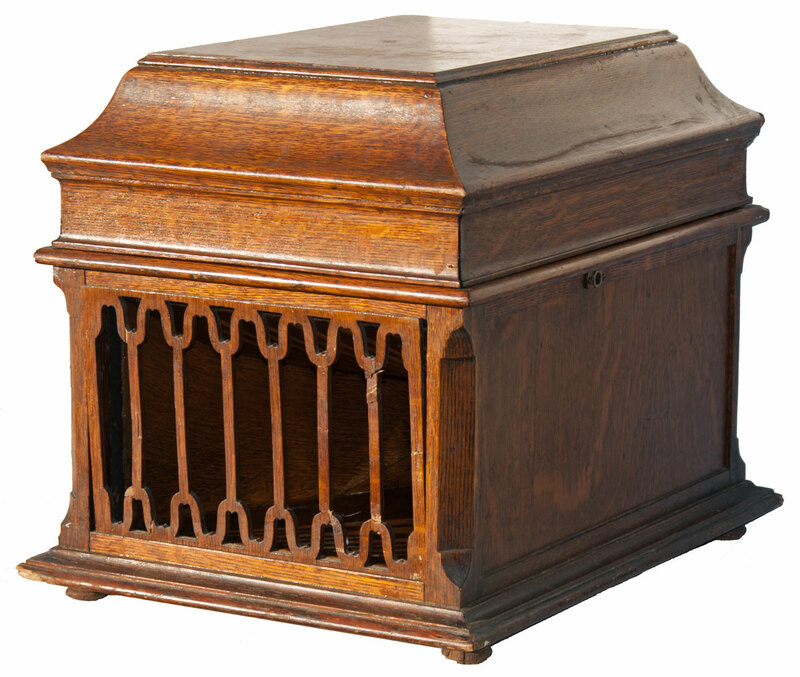 This piece originally would have been an oak grate like the one in the photo at Intertique - Edison Internal Horn Phonographs, the Amberola Models. I purchased my Edison Amberola V at a garage sale in the La Mesa/Fletcher Hills area for only $5. It appears to be complete except that it is missing the crank. It was in pieces, however. Most of the joints in the top of the cabinet had come apart. The horn and machine itself appeared to have been tossed around the cabinet. There were a few Styrofoam packaging "peanuts" in the cabinet. I didn't ask, but I'm guessing the machine had been shipped in recent years without being packaged properly. It looks like the machine itself likely came loose from the cabinet and bounced around a bit. With the old glue, the joints in the cabinet lid came loose. The inside of the cabinet lid is scratched in a few areas. It really looked worse than it is, however. I put in some dowel joiners (there were already holes) and glued the lid back together with white glue. I put in a couple of nails, but likely would have been better off without the nails. I cleaned the horn with degreaser since grease from the machine had dripped on the horn over the years. I was able to slide the horn back in. The board that covers the horn at the back was broken into three pieces. I glued it back together. I sat the machine back on top where it goes. It all fits together fine. The screws that hold the machine to the cabinet are missing. Therefore, nothing is actually screwed onto the cabinet at present. I was thinking of trying fix the scratches, but decided against it for now. Most of the finish is really quite nice. I haven't actually tried to run it since: (1) I don't have a working cylinder, (2) I don't have a crank, (3) at present I don't really know what I am doing, and (4) it would likely be advisable to first clean, adjust and lubricate the machine, preferably by someone who knows what they are doing (not me). The gears seem to rotate fine, however. The machine came with one cylinder in a tube case. The recording surface has a crack all the way through the length of the cylinder, however. The Amberola cylinders play for 4 minutes, double the time of the prior cylinders. All in all, it is a beautiful and complete machine which is in pretty good cosmetic condition and looks like it would play with a little maintenance. Quite the find for $5 and another $5 or so for dowel joiners and glue! "The Universal" Talking Machine (Large Image) (Circa early 1900s) Made by Universal Talking Machine Co. Rockford, Illinois. 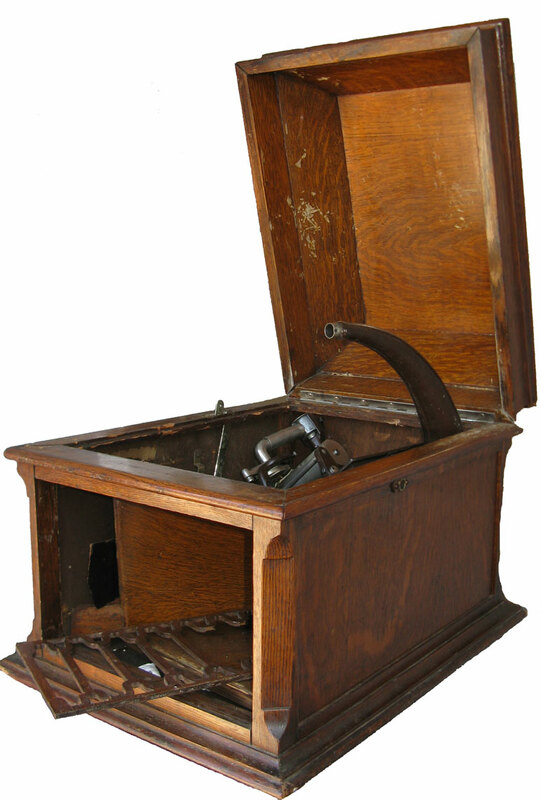 First, a very brief and incomplete history of acoustical phonographs: Thomas Edision is credited with producing the phonograph in 1877. Edison's device used cylinders - originally made out of tin and later out of wax. 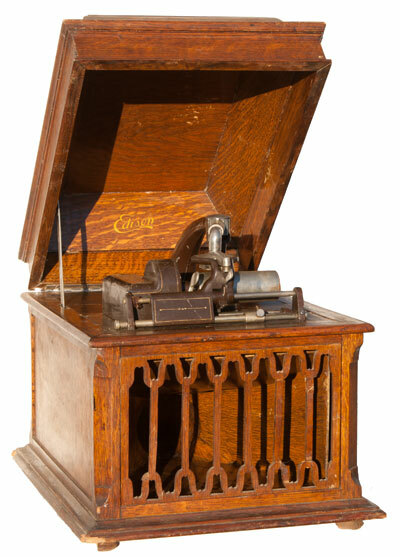 By the late 1880s Emile Berliner was patenting a phonograph that used flat plates instead. The Berliner machines were called Gramophones. Library of Congress - Emile Berliner - Gramophone. The name of the recording industry's annual award show, the Grammys, is derived from the Gramophone. Wikipedia - Grammys. Disputes erupted between Gramophone and Universal Talking Machine Co. with Gramophone cutting off record supplies to Universal Talking Machine and Universal Talking Machine allegedly using Gramophone records without permission. Eventually the Gramophone Company ceased and was succeeded by the Victor Talking Machine Company by 1901. Victor bought Universal Talking Machine Co. in 1903. The David Sarnoff Library. 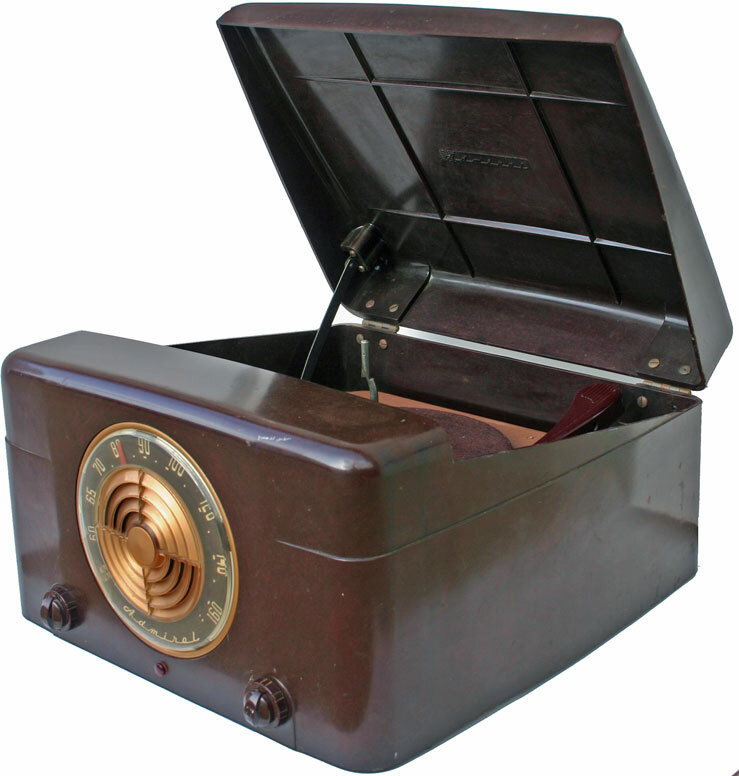 Victor was eventually bought out by RCA (Radio Corporation of America) in 1929. 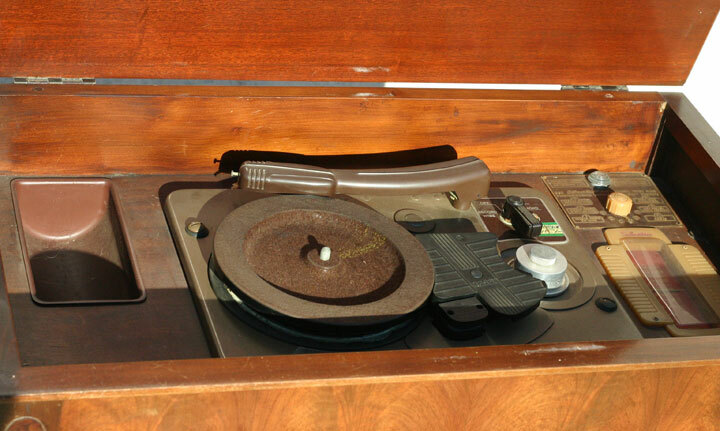 By 1930 RCA introduced an electronic turntable marking the end of the acoustic "talking machine" or phonograph. These phonographs or talking machines were entirely mechanical and made sound simply by the vibration of the needle. There was no electronic amplifier. I'm not sure when my machine was made. Victor had purchased a controlling interest in Universal by 1903. The David Sarnoff Library indicates "Zonophone," which had been made by Universal Talking Machine Co. was liquidated by 1912. I therefore assume my machine was made before 1912, but I am not sure. I purchased my machine on 9-21-08 in the Tallmadge area of San Diego for $100 from an ad on Craigslist. It is in decent cosmetic and working condition. The cabinet is a veneer over other wood. The top has a crack running across it. Some of the veneer is loose. The phonograph plays and the voices on the records are discernable. It's definitely a different sound experience compared to a modern phonograph, a CD or an mP3 player, however. It uses records which rotate at 78 rotations per minute (78 rpm) and are called 78s. More modern long play records play at 33.3 rpm. The talking machine came with 15 records, each 10" in diameter. 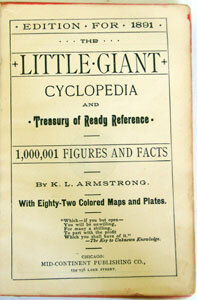 The oldest is a one sided record with a February 1, 1908 date. It cost 60 cents. Sounds pretty cheap until you realize that 60 cents in 1913, the earliest year on the Consumer Price Index Inflation Calculator, is equal to $13.28 in 2008 dollars. 99 cents on iTunes sounds pretty good. A one sided record only has one song. 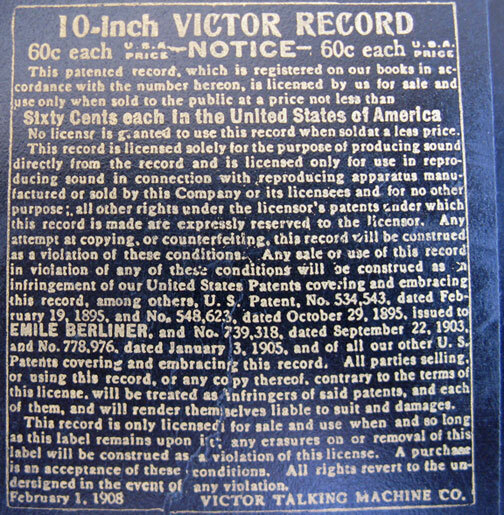 A label on the back of the record explains that it is a grant of a license to produce sound only from a Victor Talking Machine. The license and machine are hence tied together. This sometimes also occurs, directly or indirectly, today. For example, Apple software can only be used on an Apple computer. The label also refers directly to Berliner's original patent. 1949 RCA Victor T-120 12 inch television (Large Image) 1949 metal chassis television with 12 inch black and white picture tube. The cathode ray picture tube has a circular front. As indicated below, this was the beginning of the rapid rise in television sales. In July 1948 there were 350,000 thousand sets. In August 1949 there were 2 million sets. By May 1950 there were 5 million sets. I see ads for the 10 inch T-100 the year before for $200. I assume this set was therefore at least $200. That sounds pretty reasonable except $200 in 1949 has the same buying power as over $1,800 in 2010. Larger sets at the time went for $400 to $600 according to ads on eBay. In these years you were probably fortunate to get two or three channels. I purchased this set on May 5, 2010 for $50 from an ad on Craigslist. It is in very nice cosmetic condition for a 60 year old set. It comes with the custom made table it sits on. It is huge for such as small picture size. The dimensions are 21 x 20 x 19 inches. According to radiomuseum.org it has 13 tubes identified as: 6AG5 6BA6 6AU6 6AL5 6AV5 6K6GT 6BA6 5U4G 6SN7GT 12AU7 6W4GT 1B3GT 6BG6G. The seller stated that it was his grandmother's television. She recalled purchasing it in the 1940s. The seller said he and his father replaced all the tubes in an effort to restore it. He said it comes on with "snow" and some sound. I have not tried it. The electrical plug is simply two prongs and it looks like a grounding wire inside the machine was cut. I think I will therefore leave any restoration to an expert in the future. Likely the set has old paper and other unreliable capacitors which need to be replaced. (See antiqueradio.org.) Other images: back labels, close up interior, interior, table instructions. 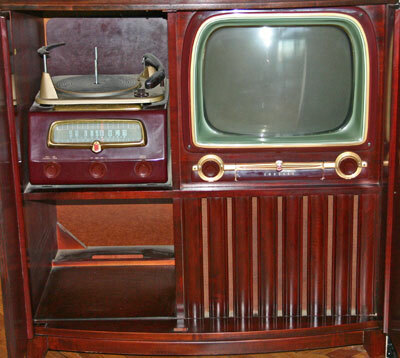 Crosley Model 11-444MU Television with AM radio and phonograph. Production started October 1950 according to www.crosleyradios.com. 17" B&W. VHF stations only. Phonograph speeds 33, 45 and 78 rpm. Ebay has multiple 1951 magazine ads for this model including one with Sid Ceasar. (See also ads for similar 1952 and 1954 models.) Purchased at a La Mesa, CA ( 1/4 mile from where I grew up) garage sale on 1-6-07 for $200. The seller said a relative who was an expert bowler won it in a bowling tournament. The seller dated it to 1946, but 1950-51 appears to be accurate. Good cosmetic condition. 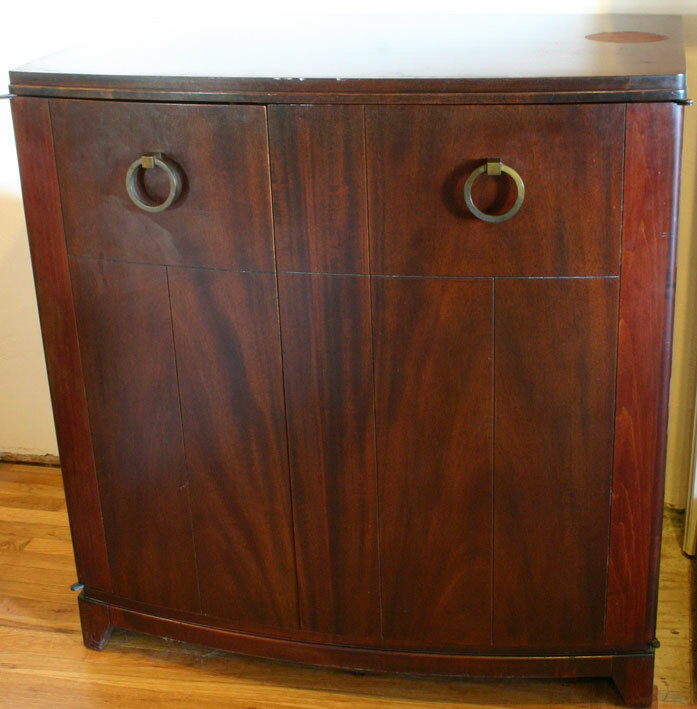 The cabinet is made of mahogany veneer with the finish generally intact except for a round spot on top where a glass was probably left. The radio does not play but the light turns on. You can hear the motor of the phonograph but it does not turn. The cord for the television is missing, but the seller indicated the television is not working. All tubes and components appear to be present. Includes Instruction booklet which is very similar to 1953 booklet at www.tvhistory.tv. Detailed radio schematic at techpreservation. (Need to download and run a browser plugin to read the djvu files.) Approx. 38" high x 37" wide x 24" deep and very heavy! Images: Large, Closed, Open, Radio Internal, TV Internal, Speaker, radio schematic, and TV schematic. 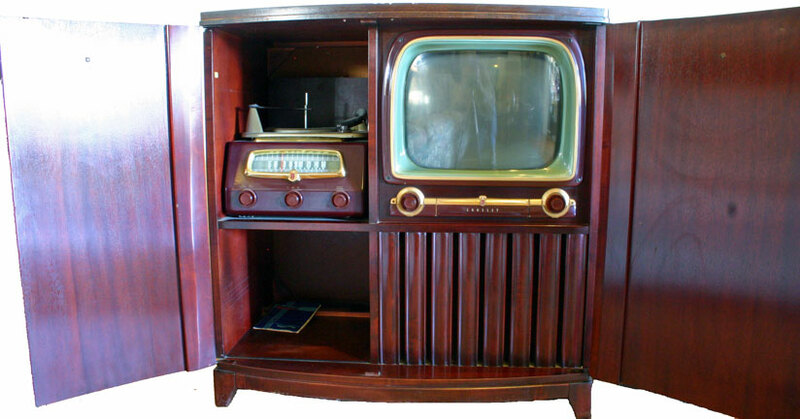 Television History Tvhistory.tv has interesting information about the history of television. 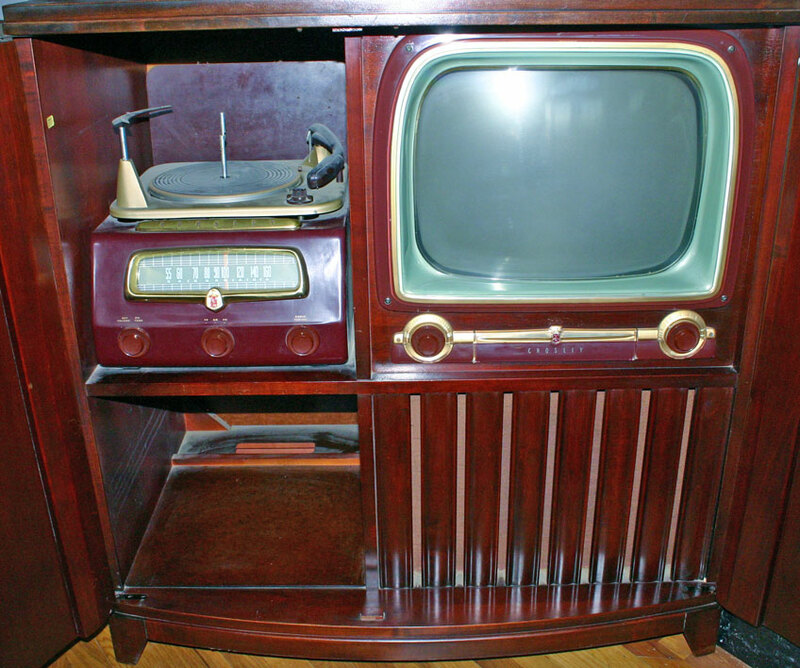 Although there were "mechanical" televisions dating back to the 1920s, electronic televisions as we know them became widely known to the public at the 1939 World's Fair. World War II put a halt to television production, however, freezing the number of sets in the U.S. at less than 7,000. www.tvhistory.tv. This number rose rapidly after World War II with 350,000 sets and 27 stations in 18 cities by July 1948, 2 million sets by August 1949, about 5 million sets by May 1950, 8 million sets and 107 stations by October 1950, and 13 million sets by June 1951. Later in 1951 "I Love Lucy" started on television and continues in re-runs to this day. By the time I was born in 1957, 41 million U.S. homes had television with "Perry Mason" and "Leave it to Beaver" starting in that year. Color televisions were available by 1954, but total sales as of 1957 were only about 150,000 sets. The seller of my television said my Crosley originally sold for $1,000. While the $1,000 price might be off, televisions were expensive. 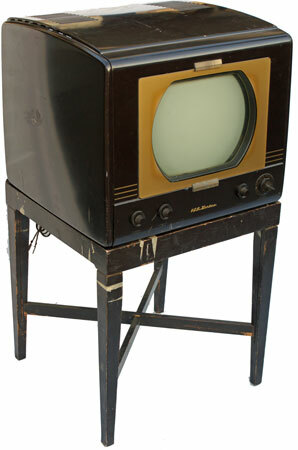 For example, www.tvhistory.tv indicates a 1950 12" Philco console with radio and turntable was $500. To put that in perspective, www.tvhistory.tv indicates a car in 1950 cost $1,750, a house cost $14,500, and the average annual income was $3,800. According to the Consumer Price Index, $1,000 in 1951 has the same buying power as $7,750 in 2006. 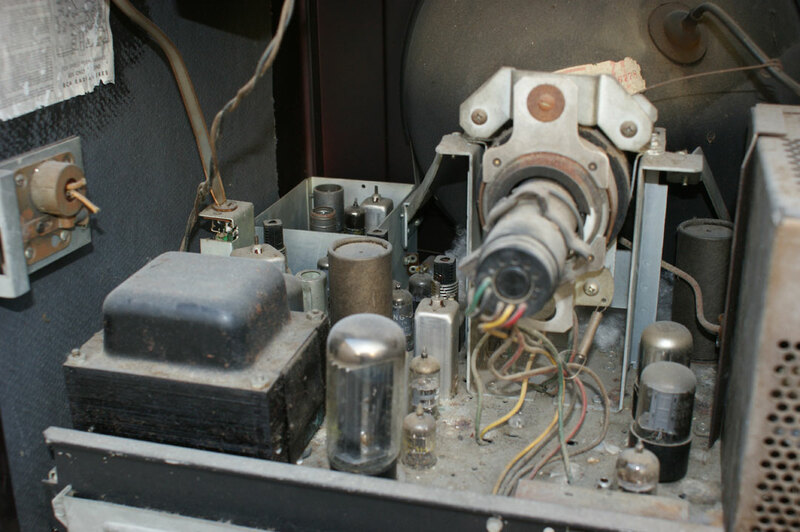 A wonderful site about radio and television restoration is Phil's Old Radios" which indicates a common problem is deteriorated capacitors. 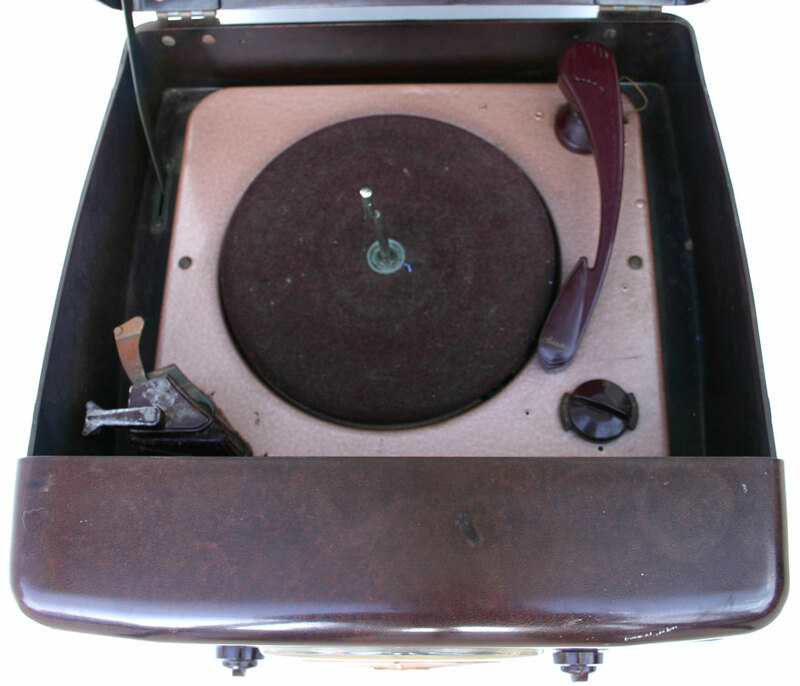 Sears Silvertone Model 7102, Chassis 101.814-1A (circa 1947-1948) Includes phonograph, AM radio and wire recorder and player. 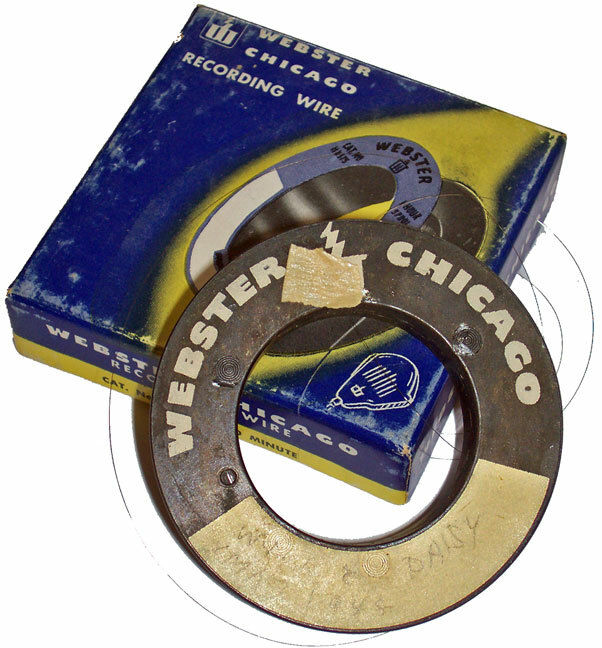 Wire recorders were used before tape recorders as explained in a 2000 Chicago Tribune article. Initially developed around 1900, they were used for military purposes by the mid 1940s. After World War II, Webster Chicago, Sears Silvertone and others made them for consumer use. The use of recording wire was short, however. 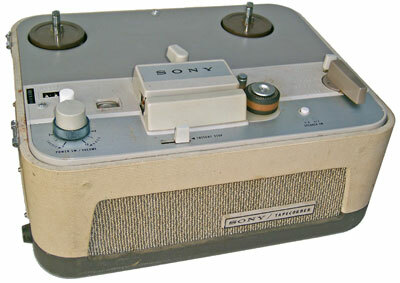 As can be seen in the discussion of the Sony recorder below, tape recorders were available by the early 50s. 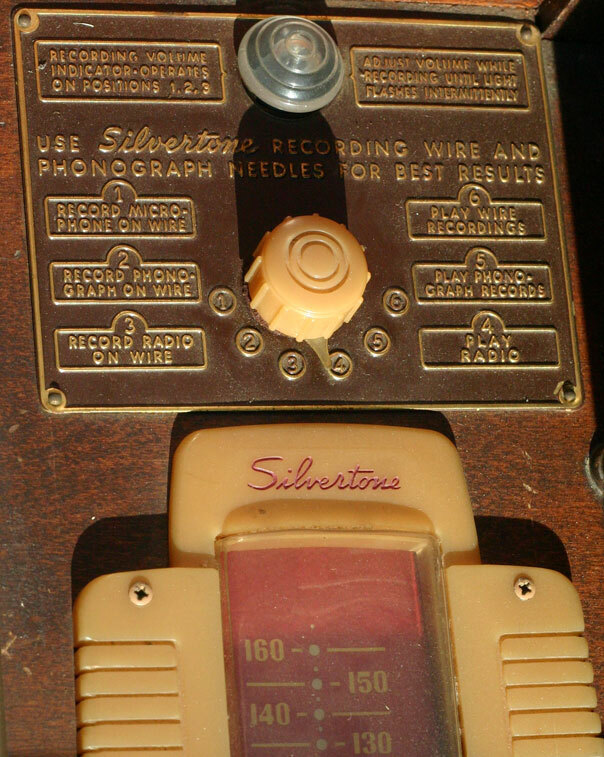 My Silvertone could record from microphone, radio or phonograph. I bought for 25 cents a reel of recording wire (reel about 2.5" in diameter) at a La Mesa, CA garage sale a couple of months before I purchased the Silvertone. I could have bought an entire box, but never thought I would have a wire recorder. The wire itself is very thin like very low test monofilament fishing line. The turntable is small and for 78 RPM records only. The cabinet is about 33.5" high, 25" wide (with the top an inch wider), and 14.5" deep. The top is solid mahogany. The wood throughout is beautiful and the finish is generally in good condition. A similar Silvertone Model 8102 is pictured at Pat's Gallery. A more elaborate 1947 Silvertone Model 101.831-A is pictured at N0QDS and Museum of Radio and Technology. 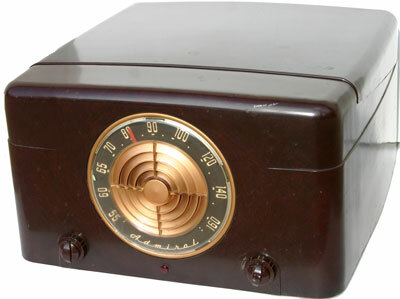 Silvertone was Sears' brand name for a variety of radios, televisions, hearing aids and musical instruments used by Sears from 1915 to 1972 according to the Sears Archives. The Sears Archives state that "Silvertone wire recorder, radio and phonograph entertainment system [was] introduced" in 1948. Radio Museum lists the year for the 7102, however, as 1947. I purchased from olditemsale.com the Sams "Photofact Folder" for the 7102 and similar tabletop model 7085. The publication date is 12/47. My radio was purchased at a La Mesa, CA garage sale on 12/30/06 for $40. I also purchased the Corona 3 typewriter below at the same garage sale. The turnable turns. The dial for the recorder lights up, but the recorder does not move. I could not get the phonograph or recorder to play sound. 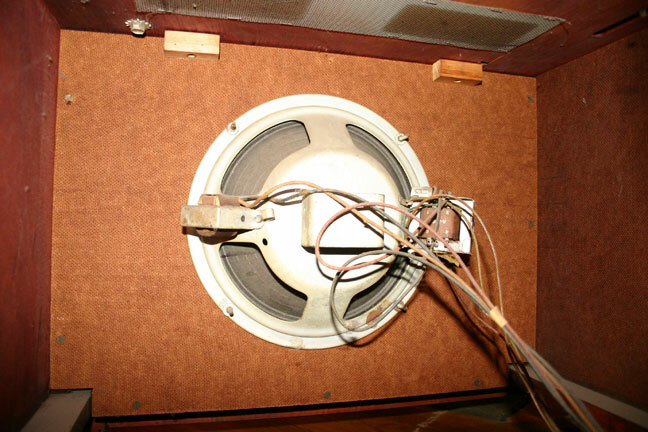 A second speaker was installed by the seller's father in the 1950s for hi-fi sound. I successfully got the speakers to play from a modern stereo amplifier. Images: Large, Top, Dial, and Interior. RCA Victor Model 9-X-571, circa 1950, a vacuum tube radio, purchased at a local garage sale on November 28, 2004 for $30. It has a Bakelite cabinet made to look like wood. Bakelite is a synthetic resin used before plastic. The radio has 5 tubes, is single band (AM) and has a "Superheterdyne" speaker. The tubes are 12SA7, 12SK7, 12SQ7,50L6GT, 35Z5GT. It is referred to as a bullhorn design because of the speaker design in front. Like other RCA radios at the time, a sticker on the back certifies that "this instrument has the acoustical balance which produces the tones of the Golden Throat." It is in very good working and cosmetic condition. The electrical cord was replaced. It has an RCA in plug allowing you to hookup a CD player, iPod, tape player, or other device. I hooked it up to a tape deck and it sounded great. See Antique Radio Restoration and Radio Era Archives (has one for sale for $109) for additional information. 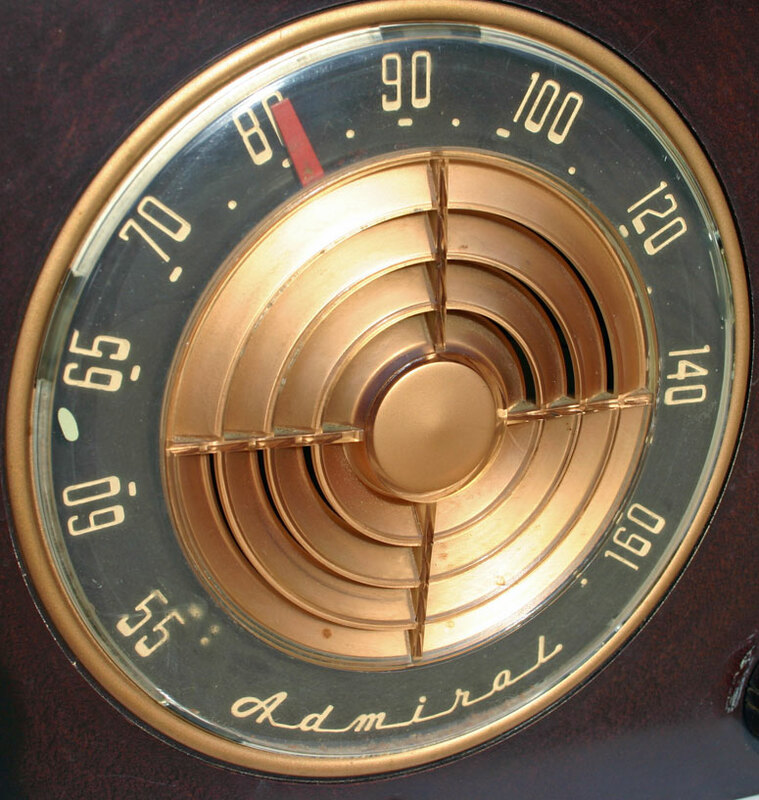 Take a look at the following sites to see how radios work, Radio Design, How Stuff Works, and about antique radios. Admiral Model 6S12 N AM Radio Record Player (1950) AM desktop tube radio and record player with plastic cabinet. Date from www.radiomueum.org. 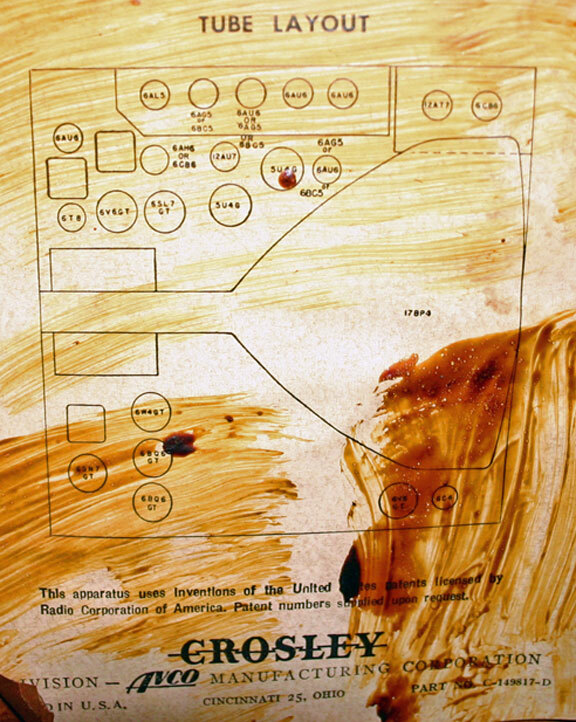 Schematics available in PDF format at www.nostalgiaair.org. Purchased at a garage sale in the College area of San Diego on 12-29-07 for $20. In good cosmetic condition. Radio works with good sound and a wide range of stations received. I haven't gotten the phonograph to work yet. 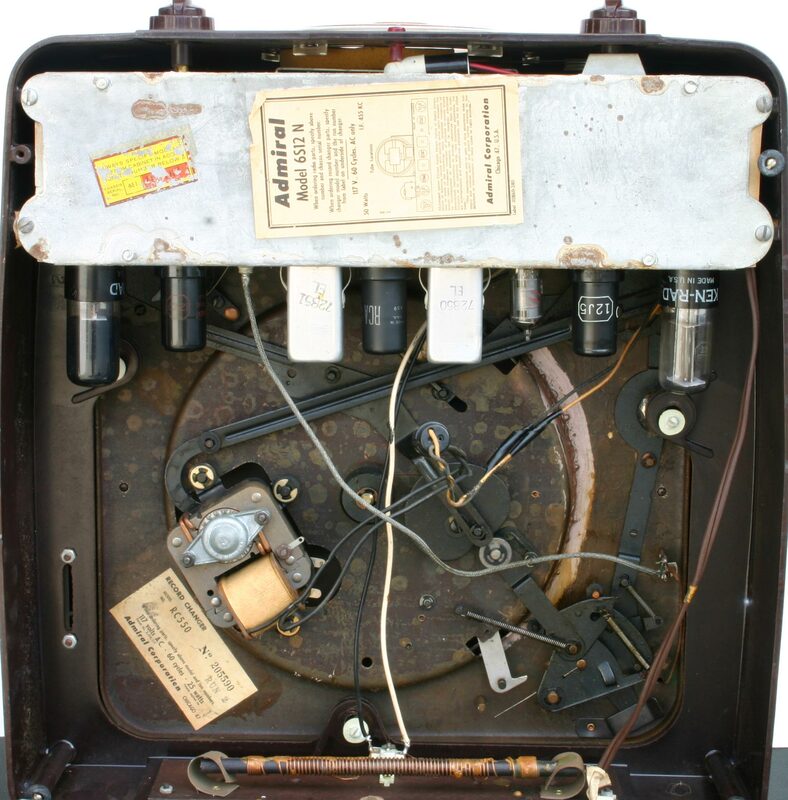 Some of the wiring is cracked and should be replaced if the radio-record changer is to be used. Cool design with the single speaker is in the center of the dial. 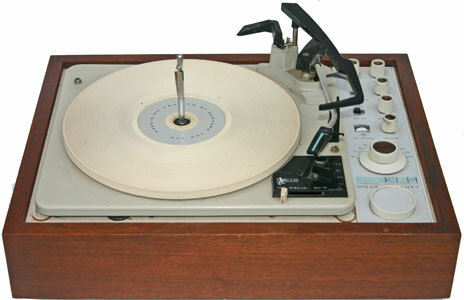 The seller said it belonged to his grandfather who also had a record player-recorder which would record onto a record. 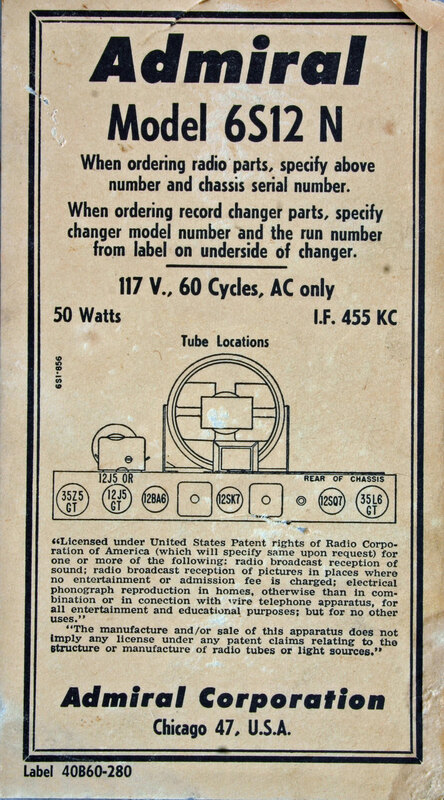 Additional Images: Large Image, Radio Label, Record Changer Label, Opened, Record Player, Dial, Internal View from Bottom. Sony Tapecorder 102 (circa late 1950s) followed the similar Sony Tapecorder 101 marketed in 1951 and one of the early Sony consumer products. See Reel to Reel Audio Decks. The later model 103 dates to about 1962. See Radio Museum. I'm assuming the Model 102 came between these two dates and hence was likely marketed around the late 1950s. Sony History and EETimes discuss Sony's development of the first Japanese tape recorder in 1949 and the early 1950s. Wikipedia discusses reel to reel recording generally. Vintage Open Reels states that generally vintage reel to reel recorders are worth little or nothing noting that world wide there may be one thousand on Internet auction sites at any one time. See also www.bassboy.com. That being said, they are also a part of history and represent the ingenuity and craftsmanship of the people who designed and made them. It is a portable unit with dimensions of about 33cm X 18cm X 26cm - let us say bigger than an iPod! It was made by Sony in Japan and distributed by Superscope located in Los Angeles. The new price for a somewhat similar looking Gemark tape recorder in the 1961 Sears Camera Catalog was $77.50 which is equal to over $525 in 2006 dollars. 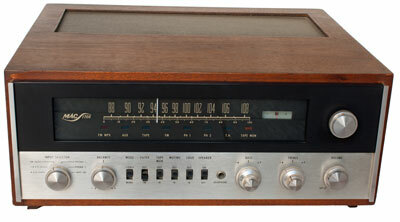 A Webcor Regent Hi-fi recorder in the same catalog was $169.95 and a full size stereophonic recorder was $349.50. As a child I remember reel to reel Wollensak tape recorders about the size of the Tapecorder 102 or larger being used at school. As a young child I was fascinated by a much smaller reel to reel tape recorder that my dad brought home from work which approached the size of later cassette recorders. My Tapecorder was purchased at a La Mesa, CA garage sale on 8-19-06 for about $5. It comes with the microphone, case cover and assorted cords. It belonged to an elderly gentlemen in Lemon Grove, CA who passed away. It works, although the fast forward and regular speeds appear to be about the same. It did not come with reels and tapes and hence I will test it further in the future. 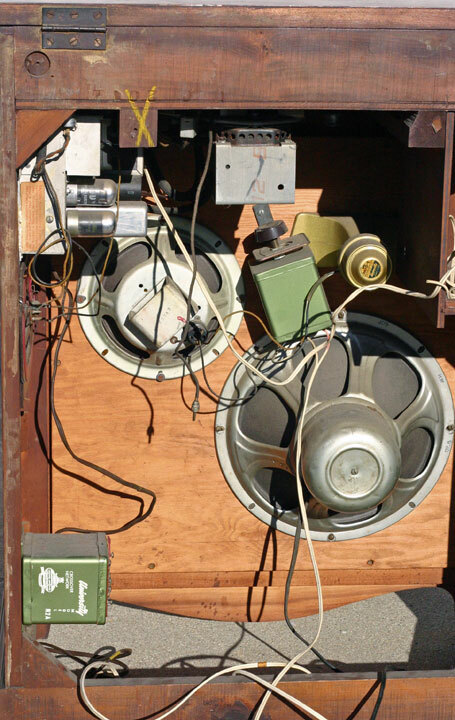 Homemade Speakers (circa early 1960s) (Large Image) purchased at a private estate sale in the Allied Gardens area of San Diego on 2-22-09 for $5 to $10 for the set. (Listed for $10. Added to a package of other things for $5 more.) These were made by the seller's father who had recently passed away at the age of 92. The father was originally a chemist and then an industrial engineer in Los Angeles. He was an excellent woodworker and continued woodworking until a few months before his death. He was also familiar with electronics and was an avid photographer doing his own color processing. In addition to these speakers I bought an enlarger and darkroom equipment, a Minolta SRT 101 camera in fantastic condition with a great selection of lenses and a Voightlander Bessamatic camera. The speakers appear to be made from maple veneer plywood. The finish is very nice and is in good condition. The speakers are very large at 26.5" high, 32" wide and 15" deep. They are made like a piece of furniture and have sort of an early American look to them. You can tell they were made with great expertise, pride and attention to detail. A wonderful one of kind pair of speakers! Kenwood TK-60U receiver/amplifier (1966) (Large Image) Date is from the German site Hi-Fi Klassiker referring to the TK-60E which appears to be the same except it has a wood grain finish on the metal case. That site describes it as one of the best receivers at the time and the first Kenwood receiver without tubes. The price was 1248 DM. In 1966, the conversion rate was 4 Deutsche Marks to 1 U.S. Dollar. (Historical Dollar-to-Marks Conversion Page.) The U.S. price would be approximately 1248/4 = $312. Adjusted for inflation, that's slightly over $2,000 in 2009 dollars. I paid $30 total for my TK-60U and a Pioneer PL-10 turntable at a La Mesa, CA (Harbinson Avenue) garage sale on 3-21-09. For the prior two weeks, a TK-60 was listed on eBay with a buy-in-now price of $49.00 with $38.00 shipping. I assume the TK-60, TK-60U and TK-60E are all the same model except for the cosmetics of the case. The TK-60 gets good reviews at audioreview.com. It was reviewed in the October 1966 Stereo Review magazine as indicated at www.roger-russell.com. Mine is in very good cosmetic condition. It works well and sounds great except one of the channels is much lower in volume than the other. KLH Model Twenty-One, this is an early transistor desktop, FM only, radio, with an excellent acoustic suspension speaker, from the early 1960s designed by famed audio designer Henry Kloss who had left Acoustics Research to form KLH in Cambridge, Massachusetts. It was made in Massachusetts, has a solid walnut case, and is praised for its full, rich sound. 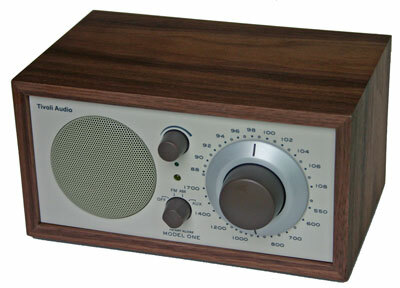 It has been emulated by modern radios such as the Tivola Audio Kloss Model One discussed at www.geek.com. I purchased the KLH Model 21 at a local garage sale for $5 in early 2004. It is in excellent condition. The same week a similar one was selling on E-bay for $65. The technology parallels computer technology at the time which was also shifting from tubes to transistors and eventually integrated circuits. KLH Model Twenty (circa 1967) FM stereo and phonograph with walnut cabinet and matching walnut veneer speakers. It is beautiful to look at and to listen to. 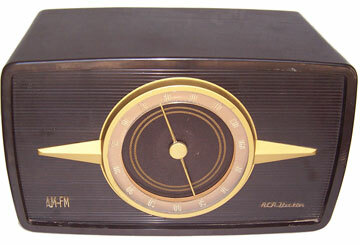 This is the basic KLH Model 20. You could also get it with a cover, or for the ultimate experience, the Model 20 Plus with speaker stands also. 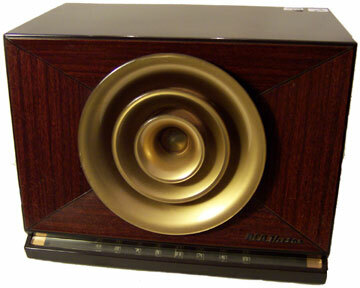 There is a photo of a gorgeous Model 20 Plus at The Classic Speaker Pages Forum. It is a wonderful piece of 1960s modern design. Made in Cambridge, Massachusetts. Cost for the basic model was $400 according the discussion above, and $525 for the Model Twenty Plus. It was an expensive compact stereo when you consider that $400 in 1967 has the same buying power as over $2,500 in 2009! You could also get it with AM in addition to the FM. 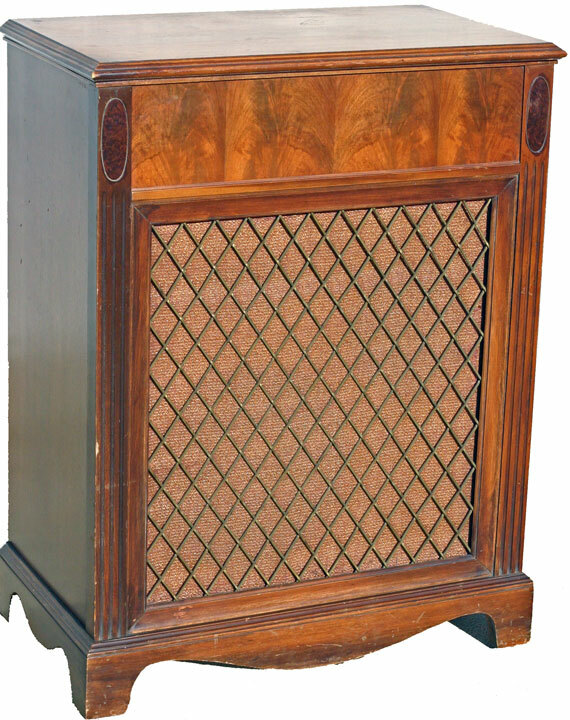 It was described as a compact system with the speakers and receiver/phonograph sold as a match set. As explained at mombu.com more sophisticated and expensive sound systems were available. The Model 20 is still a classic, however. Several sites have excellent discussions including: The Mid Century Modernist, Antique Radio (includes discussion of Henry Kloss). There are also YouTube videos: Demonstration of an AM/FM Model 20, AM Model 20. I purchased mine Model Twenty in about 2007 for about $40 at a Fletcher Hills area of El Cajon, CA garage/estate sale. It is in good operating and cosmetic condition. I had to replace the plug since it had been cut off to fit into some cabinets. As I recall, the family originally came to the area in the early 1970s bringing the Model Twenty with them from New Jersey. McIntosh Mac 1700 Stereo Receiver and Amplifier (Large Image) (1967-1973) Long before there was the Apple Macintosh, there was the finely crafted McIntosh Mac 1700 stereo receiver. I believe mine is from July 9, 1970 since that is the date on the McIntosh Performance Inspection sticker. There is another performance inspection sticker on top of that sticker indicating it was again checked by the dealer in 1976. The Mac 1700 was priced at $599 with the wood cabinet an extra $29 for a total of $628. $628 in 1970 has the same purchasing power as $3,745.45 in 2012! The machines were assembled by hand by the "girls" at the McIntosh facility at "McIntosh Laboratory Inc., 2 Chambers St., Binghamton, N.Y." according to The McIntosh Touch story in one of the publications that came with my machine. 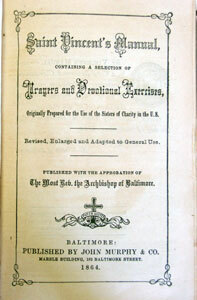 The introduction of the pamphlet with "The McIntosh Touch" states "The aim of McIntosh. . . to give you the most performance, the most reliability, the most satisfaction, for the least investment." 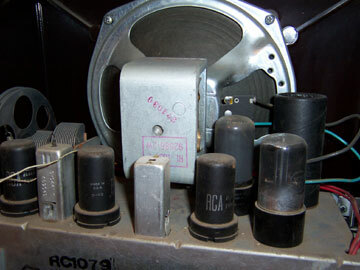 The Mac 1700 is a bridge between tubes and transistors. The preamplifier and amplifier both are solid state with no tubes. 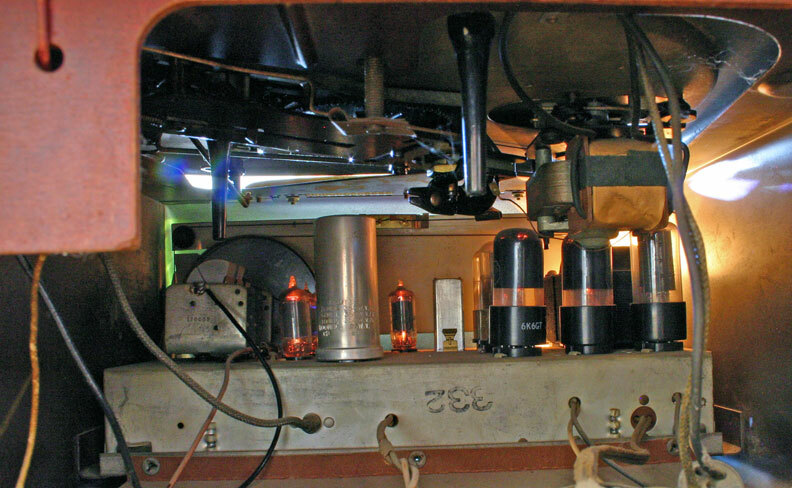 The FM tuner, however, uses tubes. According to the owner's manual, the preamplifier uses 16 silicon transistors while the amplifier uses 18 silicon transistors and 12 diodes. 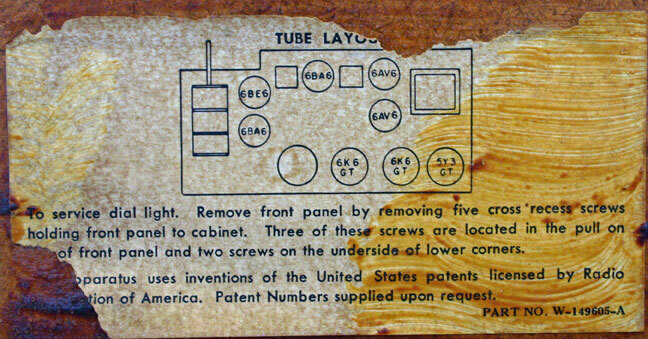 The FM tuner still contains 8 tubes along with 4 transistors and 10 diodes. The power supply contains 8 rectifiers, 1 Zener diode and 1 transistor. The Mac 1700 still sells well on the used market with eBay completed listing prices as of early November 2012 falling between roughly $200 and $600 depending on condition and not including shipping. The receiver weighs 38 pounds so shipping can be expensive. I purchased mine on November 3, 2012 for $27.50 plus tax at an estate sale in the Del Cerro area of San Diego. It is in good cosmetic and working condition. It includes the wood cabinet in good condition as well as the owners manual, the schematic diagram and several pamphlets about McIntosh equipment. An owner's manual in pdf format is also available at sportbil.com. There was a hum on one channel at first but it went away. There was also some smell coming from the unit when it was on. I don't plan on using it unless I get it checked out. 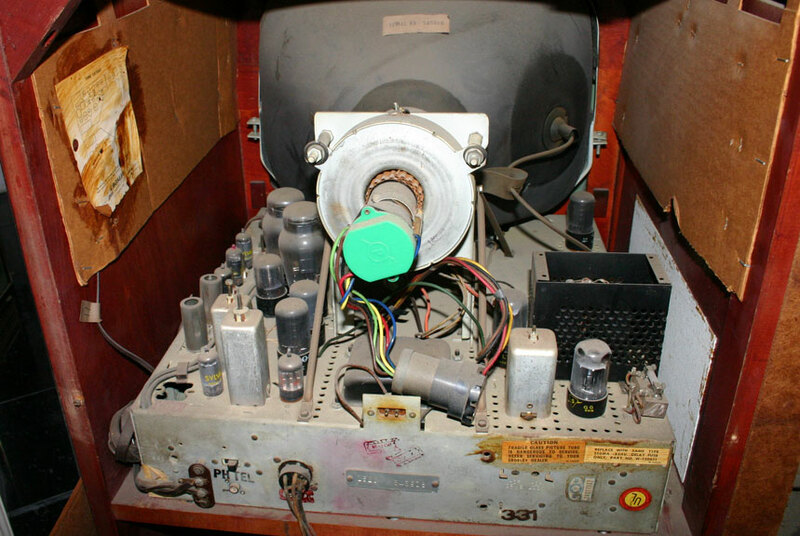 Apparently, it is advisable to clean the switches and potentiometers with older stereo equipment as described in this audiokarma.org discussion. Also, often capacitors should be replaced as described at Maxwellrosspierson.com (instructions specifically for the Mac 1700). That site has also posted the service manual. Tivoli Audio Model One Henry Kloss AM/FM Table Radio (Large Image) purchased new January 5, 2008 at Target for $69.98 on clearance. It was originally developed around 2000. The typical price is $120 and Target had been selling it at $100. Even at $70 it seems very pricey, but it does have remarkably rich sound for such a small radio. It generally gets good reviews. See, e.g., cnet.com. It is designed by famed audio designer Henry Kloss who also designed the KLH Model Twenty-One FM Radio above some 40 years earlier. It has a real walnut wood laminate case while I believe the Model Twenty-One had a sold walnut case. Also, while the Model Twenty-One was made in Massachusetts, the Model One is designed in Massachusetts, but made in China. According to the box, Henry Kloss lived from 1929 to 2002. See Wikipedia - Henry Kloss, New York Times Obituary. The Model One is a small table top radio with dimensions of 8.375" x 4.5" x 5.25" and weighs 3.94 pounds. It has only a 3" full range driver. Nevertheless it has a deep, rich sound. It is the essence of simplicity. The box states: "In a world filled with complicated, high-tech gadgets, it's nice to be able to retreat to something that you can simply turn on and tune in with ease. Sometimes the simplest things in life can also be the most pleasurable." An excellent lesson in design and life! It has an auxiliary in port that accepts a male 1/8" stereo mini connector. You can therefore hook it up easily to an mp3 player, iPod, or computer. I used it with my son's iPod and it sounded great. With this and an iPod, you have in a very small package an alternative to a large stereo system. It also has a stereo headphone output jack and a stereo record out jack. I plan to take mine to my classroom where it should be able to provide sound to the entire classroom in a small package. I like the idea of a mono speaker also because the cords of computer speakers with two or three speakers always get tangled up. A very cool, simple audio device. Sony Digimatic LED AM-FM Clock Radio, (circa 1972) Model No. 8FC-69WA, 8 tranisitor, Frequency Range: FM 87-108MC and AM 530-1605KC, IF: FM 107.4MC and AM 455KC, Power Supply AC 117V, 60c/s, 5 W. A stylish radio apparently from 1972 according to repair manuals for sale. It has a real wood cabinet with walnut (I think) veneer. 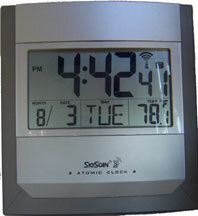 There are many ads for sale on eBay and elsewhere for an essentially identical model except with flip number clock. This one has a red LED display. Round 8cm diameter speaker on bottom. Dimensions are about 10cm high x 30cm wide x 14cm deep. Seems to be one of the earliest models of low, rectangular clock radios most of which later had plastic cases. The radio works well. The LED display shows all zeros and I can't get the clock to set or run. I may be doing something wrong or it may be broken. Purchased at a garage sale I believe in early 2007 I think for a dollar or two. Sony STR-6046A Stereo Receiver (1974-1979) (Large Image, With Vintage KLH Speakers) a quality AM-FM stereo receiver with wood case with beautiful wood veneer. An Asian Yahoo Site had the dates and indicated it has 20 Watts per channel and 80 Watts total output. A discussion at audioasylum.com indicates it was second in the Sony line-up at the time under the STR-6046. These were the first models that Sony distributed without using its prior distributor Super Scope according to the discussion. The discussion indicates it is a quality receiver. Another audioasylum.com discussion indicates the original manufacturer's suggested retail price was $275. That's about $790 to $1160 measured in 2007 dollars. Even assuming the street price was substantially less, it was a relatively expensive receiver in its day. 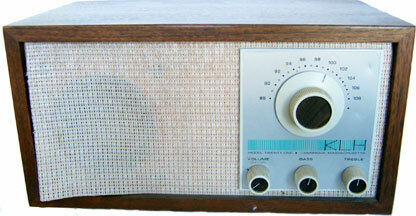 In my mind, a vintage receiver/amplifier like this is less obsolete than many think. While it does not have some modern features like a remote or Dolby Surround Sound, it is a quality receiver that you can hook up to any auxiliary input device you want like a CD player, an iPod, a computer or a DVD player. With some good vintage speakers (also less obsolete than many think), it will out perform many modern systems and look great. I paired this with some beautiful KLH wood or wood veneer speakers from Denmark I got for about $10 to $20 at a Synagogue rummage sale. I had a KLH label on the front of one speaker, but lost it at some point. The combination looks beautiful as well as plays beautiful music. The receiver and speakers seem to work well. The number of FM stations on the receiver seems limited, but I'm going to try it with an FM antenna. The receiver is in excellent cosmetic condition. The speakers have some scratches but are still nice. I purchased the receiver for $15 on 7-18-07 at the Thrift Korral in La Mesa, CA run by the Grossmont Hospital Auxiliary. My mom was a Grossmont Hospital volunteer for over 25 years and I was born at Grossmont Hospital when it was quite new. Yamaha Natural Sound Stereo Receiver CR-1020 (1977-1979) (Front, Back) Classic late 70's stereo receiver amplifier. Made in Japan. 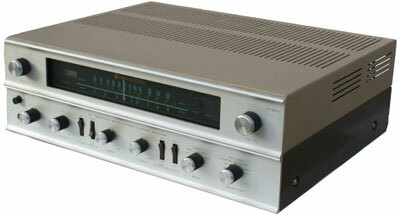 Specifications and other information at vintageknob.com, Yamaha CR-1020 Receiver - www.mcqart.com and Classic Audio. Large and heavy with classic looks including real wood veneer on plywood. In great cosmetic and working condition. 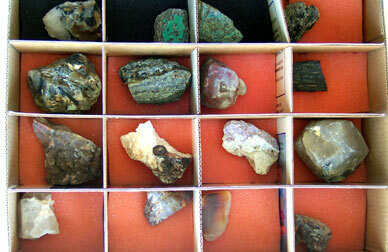 Purchased at an estate sale on 11-21-09 in the Clairemont area of San Diego for $45. That's likely a good deal since there are ads on Craigslist in other areas of the country for $150 and $200. There is a Buy It Now on eBay for $149 plus $58 shipping. It's a nice example of a long lasting technology which is both beautiful and functional after 30 years. It works with old and new audio technologies. 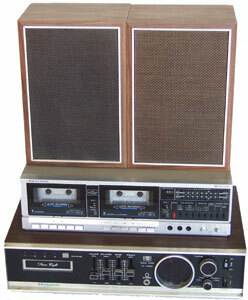 You can listen to AM, FM or hook it up to a phonograph, tape player, CD player, iPod, MP3 player or computer. I tried it out with some classic KLH Model 6 vintage speakers that I purchased earlier for $15. The combination sounds great. You don't get a remote or digital tuning, but I like using the silky smooth tuning dial. Yamaha is an extremely diverse group of companies known for quality musical instruments, electronics, motorcycles and boat engines. See Yamaha Corporation - Wikipedia. Electrophonic T-800. An entire stereo system for $1.50! The Electrophonic T-800 AM-FM receiver and amplifier, with built in 8 track tape player and bookshelf speakers, was purchased at a garage sale on May 28, 2005 for $1.50. It is in good working condition except the volume control slide switch is a little sensitive and the connection at one of the speakers is loose. It has a plywood case with imitation wood covering. It is made in Japan. I'm guessing it's from the early 1970s. Peak power is 200 watts. It is still a useful piece of equipment for the radio or to hook up new equipment like a CD player. (Rear Imputs) I've included a Realistic SCT-100 cassette deck which I obtained several months earlier for free since it was being thrown away. It is in good working condition. I'm guessing it's from the 1980s. It has a metal case and was made in Korea. 8 track tapes were popular from about 1965 when Ford started to install then in cars until about the late 1970s. 8 track tapes form one continuous loop. Smaller cassette tapes, introduced in 1963, eventually won out over 8 track tapes. While still used today, cassettes are less frequently used with the advent of CDs, iPods, and other digital media. Indeed, we have four nice cassette decks which are rarely used. Of the other three, one was purchased new and two were inherited from my father-in-law. More information about 8 track and cassettes can be found at these sites: Wikipedia Cassette, Wikipedia 8 Track, and Recording History - 8 Track. Craig Model 2603 Cassette Tape Recorder (circa 1968). Date is from a K-Mart ad in the December 17, 1968 Syracuse Herald Journal available from www.newspaperarchive.com. The ad lists three Craig portable cassette recorders including the 2603. The price for the 2603 appears to be either $48.88 or $58.88. $48.88 equals over $280 in 2006 dollars! It uses standard cassettes which originated in 1963 as indicated above. It is solid state (i.e. uses transistors), has automatic level recording, a battery meter and an external microphone with a remote on-off switch. It does not have a built in microphone or a tape meter. It operates with an AC adapter or 5 C batteries. It has a rather unique 4 position toggle control for play, stop, rewind and forward. To record, you press down the red record button and move the toggle switch to play position. It is made in Japan for Craig Corporation, Los Angles, Calif. This YouTube video indicates that it was made by Sanyo, was very popular in its day, and was a nice quality recorder. 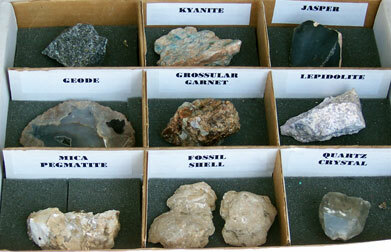 It is relatively compact at approximately 4.75" x 9" x 2.25". 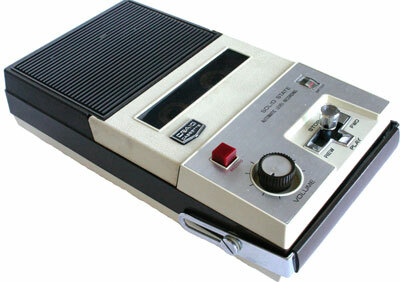 The tape recorder used in the movie Milk about Harvey Milk appears to be this model or one very similar to it. A photo of apparently the tape recorder used in the movie is at flickr. It seems to be very much like like mine but with a different color scheme - more chrome and black. My Craig Model 2603 tape recorder is in excellent cosmetic and working condition with good recording sound and playback sound for a small speaker. It was acquired for free at a garage sale in La Mesa on 5-19-06. It includes the AC adapter, microphone, manual and foam packing (but not the box). Initially it was not playing with the AC adapter, but then it started working fine. The battery compartment is like new. I acquired an idenitcal one on 7-8-10 for $3 at a La Mesa, CA estate sale. It includes the original manual, microphone, ear phone, AC adapter, a cassette with original piano music on it and a molded plastic case that it all fits in. It is in excellent condition and works fine. I have not tried it with batteries, but the battery compartment looks new. Sony Betamax VCR Model SL-HL300, serial number 117708, circa 1984, Betamax format video cassette recorder (VCR). Betamax was an early and competing format with VHS. Many believe Betamax was higher quality, but it had less recording time. Eventually VHS won out. It was called "Beta" because the tape path resembled the Greek letter Beta. The format was developed by Sony and also used by other companies such as Sanyo. Keep posted for additional links about Betamax and the competition between Betamax and VHS. Of course, video cassettes are rapidly being taken over by DVDs and recordable DVDs which have their own format wars. This Betamax was a generous donation by an OLG family on July 12, 2005. Thanks for the cool piece of VCR history! It is in good cosmetic and operating condition although I have to get some Beta tapes. Standard Western Electric Dial Phone, originally introduced in 1949, the Model 500 was the standard desk phone for decades. This phone was my first phone which I originally rented in 1979 for my apartment in Eugene, Oregon and then bought in 1982 for $25. 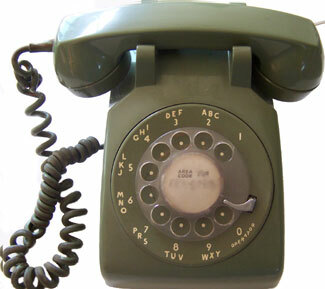 Prior to the break-up of the Bell system, you rented phones from the local phone company and did not purchase them. 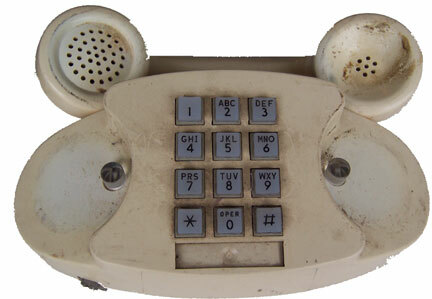 This phone was essentially the same as a 1949 phone except it had modular handset and line cords. It is in good working condition. Click to see a green Model 500 purchased for $2 on November 27, 2004 at a gargage sale. For detailed information see the Bell System Memorial Site. Western Electric Standard Touch Tone Model 2500, first introduced in 1967. 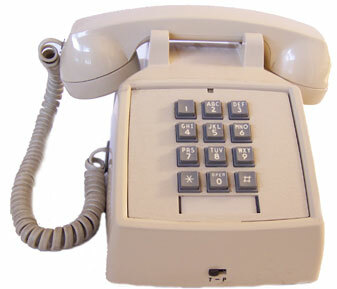 The first Western Electric touch-tone phone was the Model 1500, introduced in late 1963 or 1964. For additional information see the Bell System Memorial Site. This one has modular connections. It has the standard "Bell System Property, Not for Sale." I purchased it at a gargage sale in summer 2005 for $1. It is in good working and cosmetic condition. ITT Touch-tone Phone, this was my father-in-law's phone which we still use today. 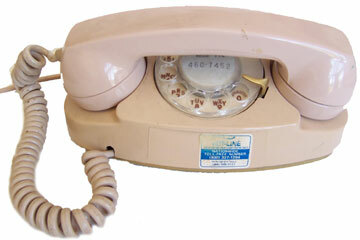 It is very similar to the Western Electric Model 2500 phone first introduced in 1967. 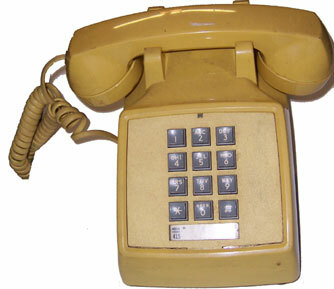 Western Electric Wall Model 2554, according to the Bell System Memorial Site introduced around 1967. 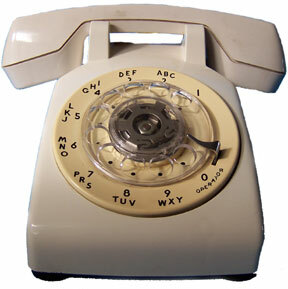 An earlier model 1554 with only 10 buttons (no * or #) was introduced around late 1963 or 1964. 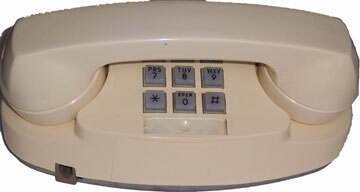 These were the touch tone replacements for the wall mount rotary dial model 554. The Model 2554 is still used today at stores like Target. 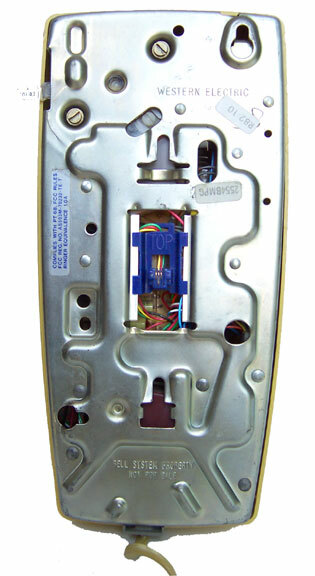 After about 1983 the metal hang-up bracket was replaced with plastic. Mine was purchased on June 11, 2005 at a local garage sale for $1. I mounted it on an existing jack in my garage and it works perfectly. The cosmetic condition is good. The label where the phone number usually is says 1972 which may indicate its age. On the back it says "Bell System Property, Not for Sale," but as indicated above these phones were offered for sale to customers after the Bell System Breakup by the early 1980s. Back View. 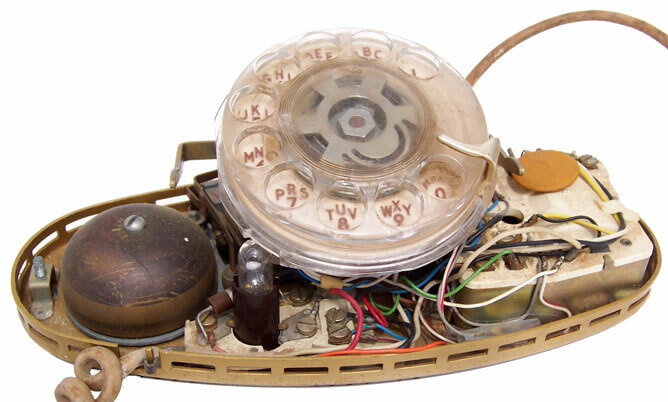 Western Electric "Princess" Dial Phone, originally introduced in 1959, the "Princess" is a cultural icon. The advertising slogan was "it's little! . . . it's lovely! . 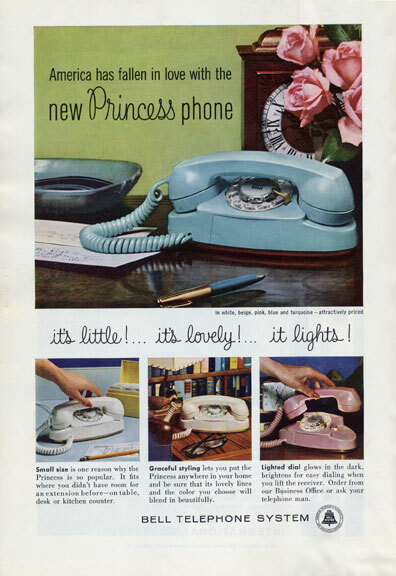 . . it lights!," as seen in a Princess Phone ad from the October 1960 National Geographic. 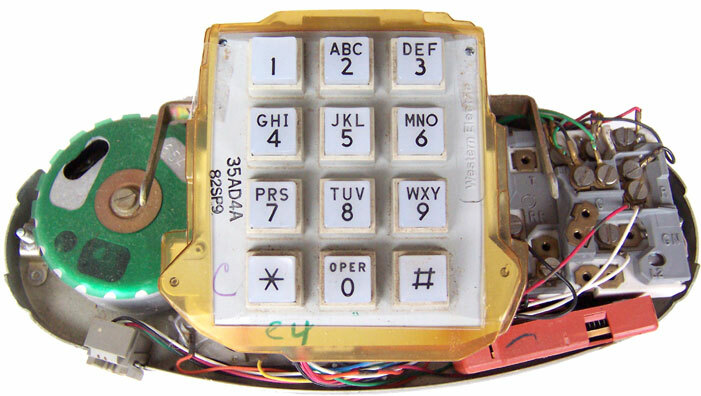 The relatively small, fashionable phone also had a lighted dial. It came in a variety of colars. Mine was purchased at a garage sale on September 24, 2004 for $2. It seems to be in good condition, but has not been tested since it does not have a modular plug. Also, to work today, the lights in these phones need an add on transformer. For detailed information on the "Princess," see the Bell System Memorial Site. I purchased two others in 2006, one with modular connections for $1 or $2, and another (interior view) on 3-25-06 with hard wired connections for 50 cents at a garage sale at which several former students were working. 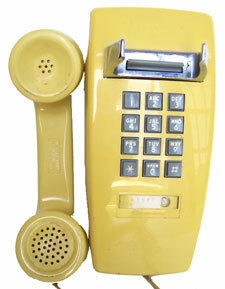 Western Electric "Princess" Touch Tone, the touch tone version of the original princess phone. Purchased at a San Carlos (San Diego) area garage sale on October 22, 2005 for $1. It is in good working and cosmetic condition except for a small crack in the case, a crack in the input connector and some color change. It was originally quite dirty but I took the cover off and cleaned it in the sink. 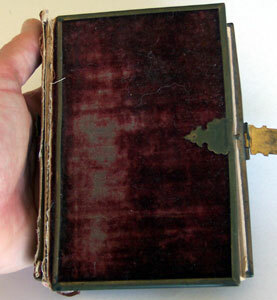 (View without cover.) It came with a long white reciever cord which was not the original. For detailed information on the "Princess," see the Bell System Memorial Site. 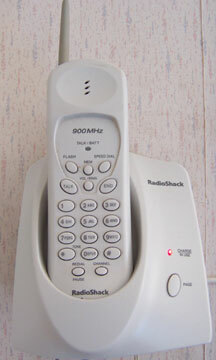 Radio Shack Cordless Phone, purchased new in the Summer 2003 for $10 after a $10 rebate, this is our main phone today. Small, light, inexpensive, works well all around the house - what more do you need? Nokia 1100 Cell Phone, an inexpensive cell phone available reconditioned with 60 minutes of service for $20 total from TracFone in 2006. Weighs less than 3.3 oz. with dimensions of about 10.5cm x 4.5cm x 2cm giving it about 20 times less volume and mass compared to the 1990 Mitsubishi phone above right. Truly amazing! 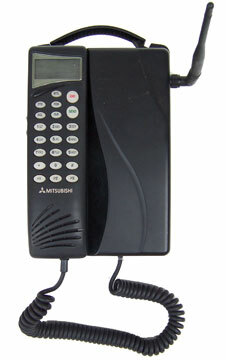 Mitsubishi Cell Phone (circa 1990) Date is from FCC information as described below. It is huge compared to modern cell phones with dimensions of about 14cm x 21cm x 6cm, not including the receiver or antenna. Its mass is about 2kg (over 4lbs.). Compare it to the small Nokia phone discussed to the left below. 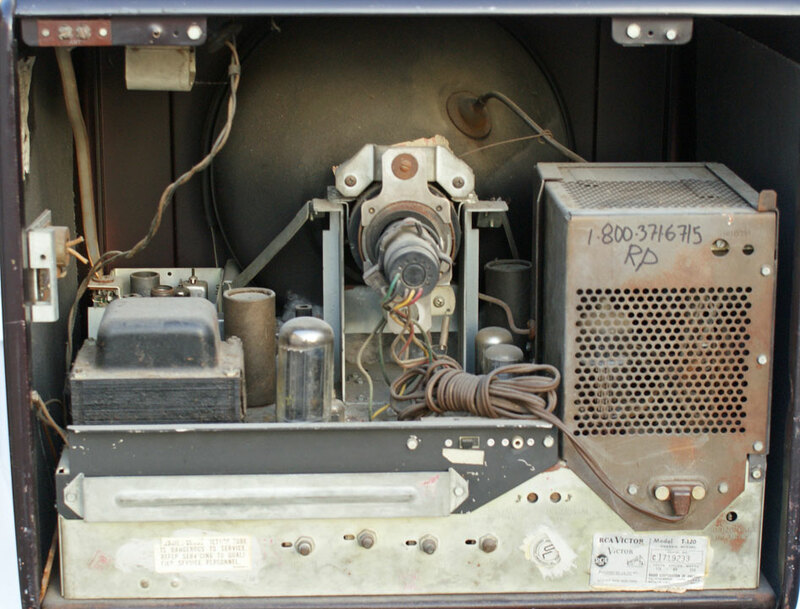 The Mitsubishi separates into two parts: the top contains the battery and the bottom contains the main circuit board and all components. The bottom case is made of fairly thick metal. It doesn't seem to have a model number. 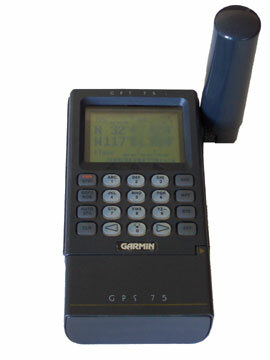 It is described as a cellular mobile telephone, type FM-4032F03, serial no. 15009D000312, Mitsubishi Intl. Corp., Wooddale, IL. Assembled in USA. FCC ID BGBFM403XF03. I googled the FCC ID. The FCC lists a date of 9/4/90. The FCC file name is Transmitter-1990.db. I assume this indicates these are transmitters registered for service in 1990. I opened the base for clues on a date also. There was nothing obvious, but a small circuit board attached to the main board has a small sticker that reads 90BMD02422-23456789A. The "90" might be consistent with a 1990 date. On the day I bought this one was advertised on eBay for $25 "Buy it Now" with a soft case to carry it which appeared to be common at the time. On the bottom of the phone is a bar code sticker with the following numbers: 15009D00312 and 8614DS14 (the S might be a 5). I thought that might indicate a 1986 date, but the FCC information appears more reliable. My personal recollection of cell phones is sketchy since in the 1980s and 1990s they were too expensive for me. I purchased it at an estate sale on 6-24-06 for $2. It is in good cosmetic condition. It comes with an extra battery and a car cigarette lighter adapter. There is no AC adapter. There is no battery leakage. I have not tried the phone to see if it works yet. If it does, I'm not sure what I would do with it!. 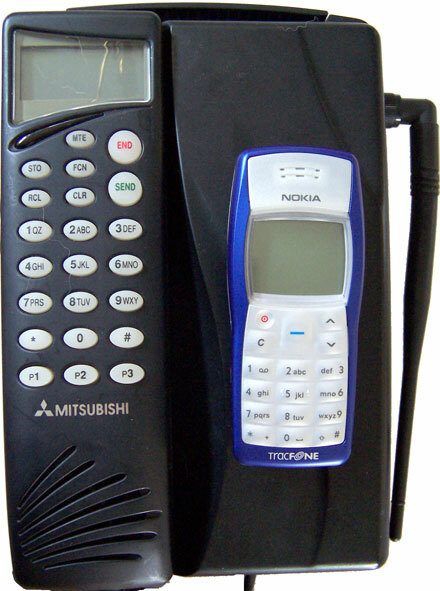 Cellular Phones, the larger Motorola phone was purchased at a garage sale for $.50. It appears to be from the mid 1990s. (Motorola, in its Freescale division, also makes semiconductor products including many of the early Apple microprocessors.) 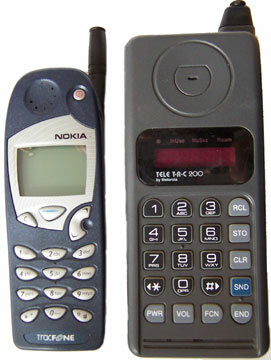 The smaller phone is an inexpensive Nokia phone purchased as part of a package for a pay as you go TracPhone service. I remember the first cell phone I saw was in the mid 1980s and consisted of a box with a hand set you pulled out. It was many times larger than either of these phones. Cellular Phones Profile, the same phones in profile showing the size reduction in only a few years. There are, of course, much more sophisticated phones today with color LCD screens, cameras and Internet service. This is truly amazing technology. Changes in technology can also be seen in the San Diego economy with the cellular technology company Qualcomm replacing former giants like aviation/defense contractor, General Dynamics - Convair, as business leaders. To see how cell phones work, see How Stuff Works - Cell Phones. Old Town Pack Canoe (Large Image) 12 foot, 33 pound, solo canoe made of Royalex� with ash and cane seat and ash cross bar. Purchased used on 8-14-08 for $250 in Coronado, CA from an ad on Craigslist. The suggested retail price from Old Town is $799. It is in good, lightly used, condition. It's a little tippy getting into (it is, of course, a canoe), but tracks and paddles well with the included long, double bladed kayak paddle. It is also very quiet. With its small size and Royalex� construction, it is also very light and can be carried by one person. I can fit it on top of my wife's Pontiac Vibe which has a rack, or fit it into my Toyota Prius with a couple of feet sticking out. I use it at Lake Murray, less than a half mile from my house. 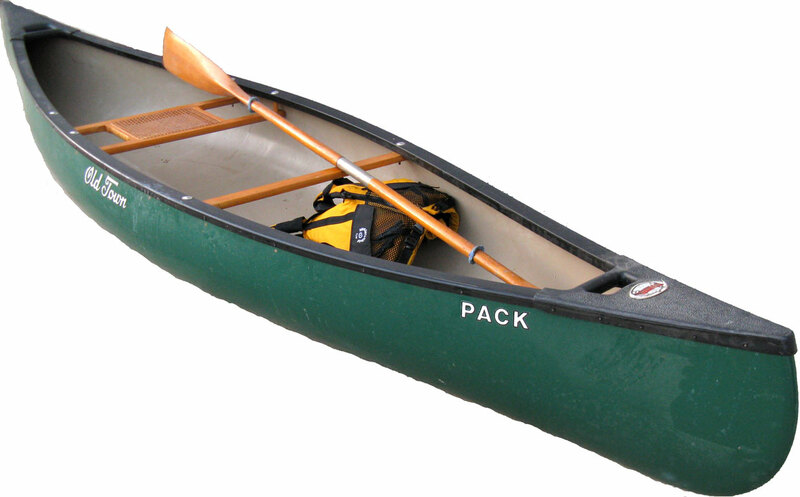 The Old Town Pack is a general purpose canoe, at home on lakes and calm rivers (class I). It generally gets very good reviews. See www.paddling.net. As a solo canoe, it is limited to one person. Some canoes can be paddle by two people, or by one person from a center seat. Canoes have a certain romance about them. These human powered vessels quietly glide through the water. You can get very close to wildlife and into very small places. Old Town Canoes built their first canoes of wood and canvas in 1898 in Maine. See Old Town Canoes - Advancing Tradtion. Their inspiration was Native American birch bark canoes. By the turn of the century they also made hand-crafted cedar wooden canoes. See Old Town Canoes - Craftsmanship.They still make cedar canoes today. By the 1950s and 1960s they started to make fiberglass canoes. See Old Town Canoes - Advancing Tradtion. Today they also make canoes out of modern plastic materials such as Royalex�. Wikipedia states: "Royalex is a composite material, comprising an outer layer of Vinyl and hard acrylonitrile butadiene styrene plastic (ABS) and an inner layer of ABS foam. The layers are bonded by heat treatment." Royalex was developed by, and is a trademark of, Uniroyal. Kevlar, an advanced synthetic fiber developed by DuPont in 1965, is used by some manufacturers to made very light canoes. Finally, Aluminum canoes were first developed by Grumman in 1944 making use of Aluminum formally used for aircraft in World War II. See generally Wikipedia - Canoe. Canoes, very ancient and eloquent vessels, are hence made from many advanced materials today. Wilderness Systems Sealution II XL with rudder (circa 1996) The Sealution II is a plastic (polyethylene) sea kayak patterned after the original fiberglass Sealution. Fiberglass is a lighter, higher performance material. Molded plastic is noted for its durability, however. Plastic does age with time and use, however, and becomes faded by UV rays. It is also susceptible to bending especially strapped onto a car roof for transporting. Indeed, I think I may have bent the bottom slightly while bringing it home. For this reason, many people transport plastic kayaks in holders that stand them on their sides rather that resting the bottom on the car roof or rack. While not as high performance as fiberglass, this plastic kayak is a capable sea kayak. With a length of 16 feet 9 inches, it is much longer than my Wilderness Systems Pungo which gives it better tracking capabilities. This Sealution II also comes with the optional rudder which extends its length to slightly over 17 feet. River Basin Canoe and Kayak has a good description of the Sealution II. It comes in two sizes - the 16'9" XL and the 14'9" XS. River Basin Canoe and Kayak apparently still sells the Sealution II XL with rudder like mine for $1,275. It is $200 less without the rudder. The XS size is $899. The Sealution II generally gets good reviews at paddling.net (8.6 out of 10 mean with one 4, one 7, two 8, five 9 and four 10). The 1996 date for the Sealution II was from one of the earlier of these reviews in 1999 that stated the reviewer purchased the kayak about three years earlier. River Basin Canoe and Kayak states the Sealution II is from the 1990s. Purchased in the Rolando area of San Diego (west of University Avenue) during their annual neighborhood garage sales on 8-1-09. It is in decent, apparently seaworthy condition. It was stored outside and therefore has some fading. The bottom has numerous scratches. The seat is faded but appears to be in working condition. The hatches are tight and the neoprene covers under the plastic covers are in good condition. It has braded into the plastic in one location the word demo. I therefore assume it was originally a demonstration model. My seller said he had it for about five years and took it to Mission Bay four times. He must have bought it used. The best part was the price - only $75. It came with a Harmony Spray Skirt and a Harmony Sea Passage paddle in either carbon fiber or fiberglass. The Sea Passage is apparently not a single model, but a line of paddle models. A new carbon or fiberglass Sea Passage paddle is well over $100. It also came with a Kokatat X-large canoe and kayak life vest (PFD) which looks similar to current Kokatat models at REI that sell for over $100. The life vest is made by Kokatat in Arcata, CA, along the Redwood coast in northern California and home of Humboldt State University. As an aside, I spent a week there in the summer of 2000 at a Forest Institute for Teachers. It was a wonderful program and a beautiful location. Humboldt State and UC Berkeley are the two California universities that have forestry programs. After receiving my B.A. in Psychology at UCSD, I started the Berkeley Forestry program but decided to go to law school at the University of Oregon instead. 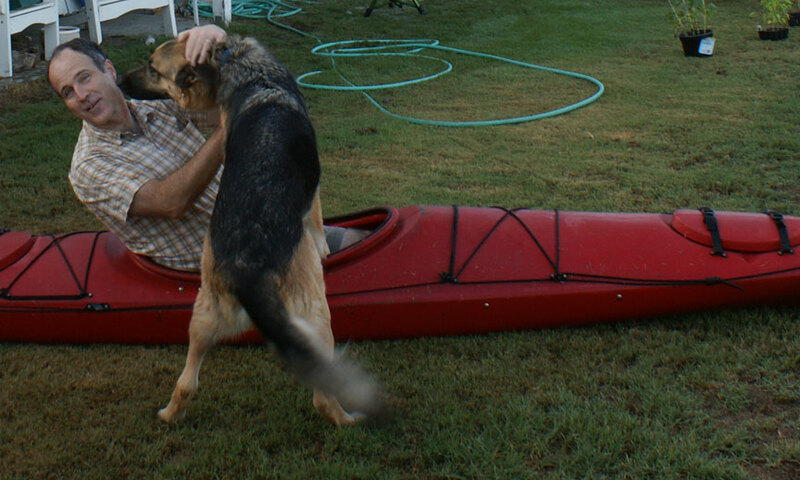 Additional image: Being attached by sea dog on maiden voyage on lawn. Kirby 518 (Large Image) (1958) Date is from The �500 Series� Kirby Vacuum Cleaners. See the Kirby Classic 1-CR entry below about Kirby vacuums generally. I acquired my Kirby 518 at a Rolando area of San Diego garage sale on 7-5-09 for free. I had purchased some cameras and other items. The seller gave me the Kirby. The seller's dad was a Kirby vacuum salesman on Long Island, New York I believe in the late 1950s. The seller indicated at that time door to door sales were more commonplace. Many of the sales were from word of mouth. My Kirby is not complete. It is missing the cord and the brush head. I have not tried it out yet. It uses only 4 amps - a third the amount of many vacuums today. YouTube has some videos featuring a Kirby 518 in action: Kirby 518 SaniEmptor, Kirby 518 on Hard Wood Floors. Kirby Classic 1-CR (Large Image) (Box) (1969-1972) Kirby is located in Cleveland, Ohio and is a subsidiary of Scott Fetzer Company and part of Berkshire Hathaway according to Kirby Company - Wikipedia. Kirby vacuums were first designed in 1906. Starting in 1925 Kirby vacuums began to be known for their versatile attachments. (See www.kirby.com - The Kirby Story.) Kirby vacuums also convert to a canister style. Most, like mine, have various attachments allowing you to do jobs like carpet cleaning. Current models have HEPA filters and include self propelled models. Kirby vacuums, then and now, are excellent, heavy duty vacuum cleaners. They generally get excellent ratings for durability and suction. (See eopions.com.) They are expensive, however, with a reconditioned one selling for $750 at thevacuumcenter.com. New ones sell for over $1,000 according to cockeyed.com and the reviews at eopions.com. According to the Kirby site - In Home Only, Kirby vacuum cleaners are sold by independent dealers who provide in home demonstrations. The site www.cockeyed.com criticizes some alleged sales techniques. Vacuum Cleaner Talk has a good discussion of the pros and cons of Kirby vacuums. My Kirby is a Classic1-CR, which is described at Yahoo France Questions and Responses as being made from 1969-1972. That date range is consistent with the 1969 copyright date on the model tag on my vacuum cleaner. That site indicates it is the first model of the second generation of Kirby vacuums. This second generation had a larger cleaning head than the earlier ones. According to that site, it did not use disposable bags. (The current models are the third generation and have disposable bags.) Rather, the dirt falls into a container. You open a latch to empty the container. I'm not sure that the person who previously owned my machine knew this! I opened the latch and started to dump the dirt in the trash can. I then reached in to get more. I then took the bag off and after much pulling and shaking emptied what may have been 40 years of dirt into the trash! After doing this and lowering the cleaning head, it seems to run and pick up things just fine. It also uses only 6 amps of electrical current compared to the 12 amps used by our Eureka Boss Smartvac and my mom's self propelled Hoover WindTunnel. Personally, I would never let a vacuum salesman into my house and I would never spend $1,000 or more on a vacuum cleaner. However, I got mine for $6 on the second day of a La Mesa, CA estate sale on 3-28-09 with the original box and most of the attachments. This worked out well for me. I get a working classic vacuum cleaner, as well as an addition to my technology museum, without the high price and door to door salesman! My wife warned me not to start collecting vacuum cleaners, however! I remember a few years back a kid on the CBS show "Sunday Morning" had an excellent vacuum cleaner collection. There are also vacuum cleaner museum Web sites. See, e.g., The Cyber-Space Vacuum Cleaner Museum and Vacuum Cleaner Museum. Vacuum cleaners are pretty simple machines as explained at How Stuff Works - Vacuum Cleaners. How Stuff Works - How to Repair Vacuum Cleaners tells how to repair them. Price does not always indicate value in selecting a vacuum cleaner. For example, as I write this on 3-28-09 you can get a Hoover U5140-900 Tempo Widepath Bagged Upright Vacuum with very good ratings for $69.95 with free shipping. One reviewer liked it better than his Oreck and another liked it better than his $500 vacuum cleaner. Kirby Heritage (Large Image) (Head) (1981-1984) List of the Kirby models from inception to present day is at Wikipedia - Kirby Company. That article groups the machines into four catagories - (1) first machines, (2) Classic, (3) Heritage - Legend, (4) Generation models with power drive. My Heritage model is the first Kirby that can take a disposable bag. It maintains the option to not use a disposable bag, however, and to just shake out the permanent bag. It is the last model to include the "Sani-Emtor" - the container the dirt falls into with the latch to empty it. The disposable bag adds the advantage of just dumping the bag and all in the trash. I assume it may also add better filtration. It, of course, requires you to buy bags. Mine came with the complete assessory kit which includes such things as a sprayer, sander, and dog cleaner. I purchased it at a La Mesa, CA garage sale on June 20, 2009 for $40 from the original owner who indicated she purchased it new for $800 from Kirby. She wanted the best vacuum available because she had children with alergies. She paid for it over time at $30 per month. She stated she was very pleased with it. In her words, "It really sucked," meant as a complement for vacuum cleaners! She used the accessory sander to sand the wood work on the exterior of her house. Apparently you take off the bag and head and then hook the sander to the electric motor. Basically, the main part of a vacuum is a large electric motor. Therefore, you can adapt it to run other things that run on electric motors. This includes a lot of potential things like most power tools and sprayers. She stated she had it regularly serviced at the Kirby dealer. The only reason she stopped using it is that she had shoulder surgery. She therefore needed something lighter and got an Oreck instead. As I write this in June 2009 ther is a similar used Kirby Heritage on eBay without attachments for only $70 with free shipping. 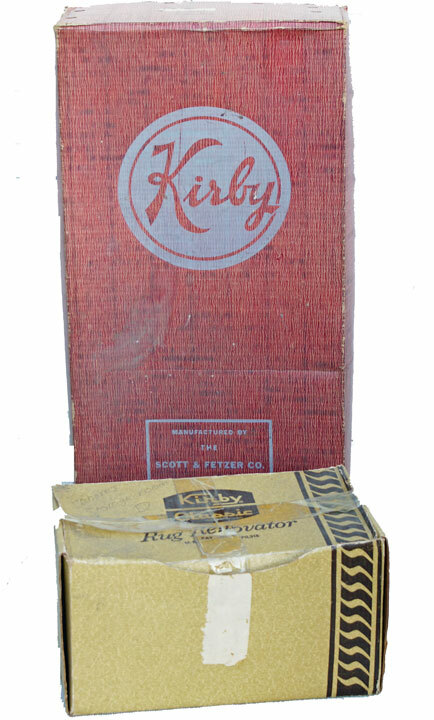 At those relatively low prices, a used, heavy-duty, Kirby may be a good alternative to a new department store vacuum. 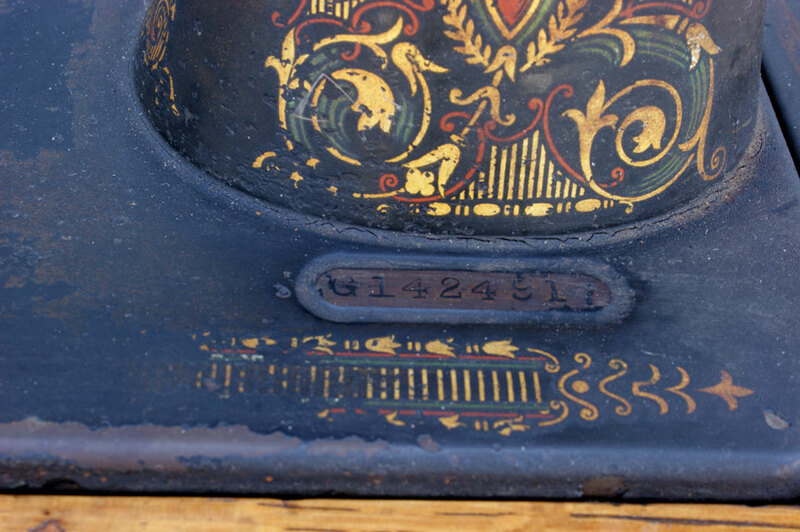 Singer Model 66 Sewing Machine (Large Image, Machine Only, Cabinet, Serial Number, 3/4 view) (1910) Date is from the serial number chart at the Singer site which also indicates it was made in Elizabeth, New Jersey. Congratulations to Singer for having the most comprehensive and public serial number information of any company I have come across in all my collections! In their earlier machines Singer did not provide the model numbers on the machine or cabinet. ID Singer Machines at www.sandman-collectibles.com has a flow chart you go through to guide you to the correct model. (Very handy! Thanks!) From this mine appears to be a Model 66 or 66-1. The Singer site indicates the Model 66 was first introduced in 1900. 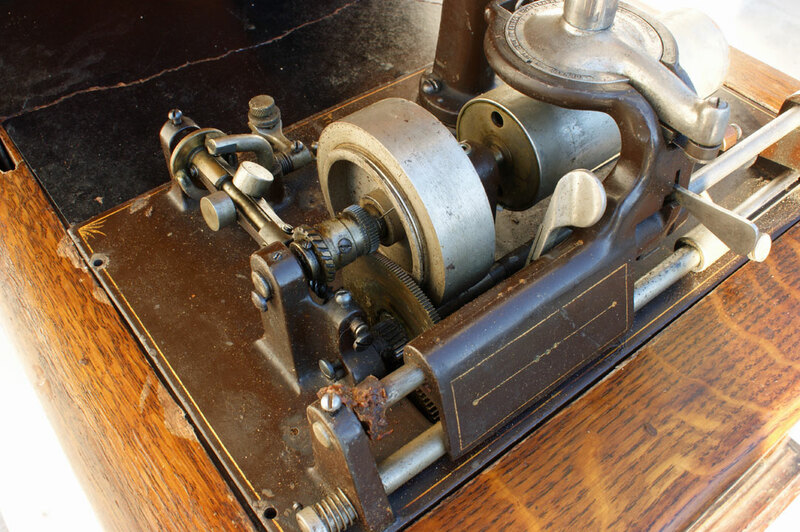 It is a treadle model meaning you have a foot pedal you push which then turns a wheel which then, by means of a cord, turns the wheel on the sewing machine itself. While electrical power was available by 1910, the first Singer electric was not introduced until around 1921 according to Singer Through the Ages at sewalot.com. An electric motor at the time cost more than a month's wages for the average worker. That site also notes that typewriter production ceased during World War I from 1914 to 1919 as production in sewing machine plants shifted to armaments. The Model 66 appears to have been a very popular machine and is still common on eBay. (See, e.g., Singer 66 Treadle Sewing Machine Red Eye Walnut.) A similar machine, Model No. 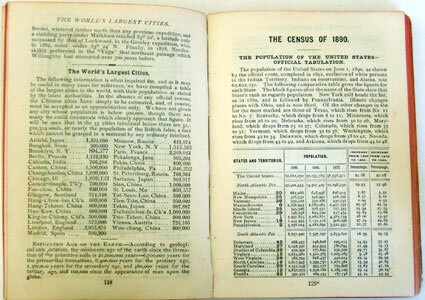 15-30, from 1902 is described at About.com - Sewing and includes photos of the operating manual. I am not a connoisseur of vintage sewing machines. 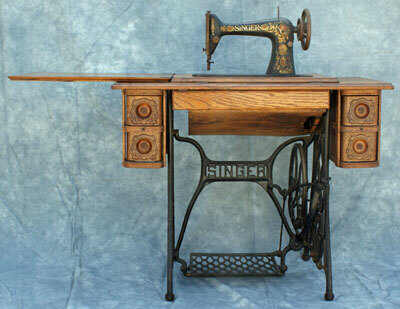 I have seen several similar treadle sewing machines in my garage sale adventures over the past several years, however. My sense is that, like old typewriters, they are old and very neat, but usually not extremely valuable. I have resisted getting one before since they are relatively big and heavy and I have a lot of old stuff already. Further, I have never used a sewing machine in my life. This one was only $25 at a La Mesa, CA garage sale on 3-20-10 and too nice to pass up, however. My wife did express dismay when I got home, however, stating: "Where are we going to put that?!" By afternoon I found a place in the garage. The sewing machine is in pretty decent condition. A small section of the veneer is removed in one area on top. Also, much of the veneer is removed in the rounded part where the machine is stored. The treadle works although the belt that connects to the sewing machine is missing. The machine itself appears to work although it is missing a few parts. The paint and decals are in reasonably good shape. 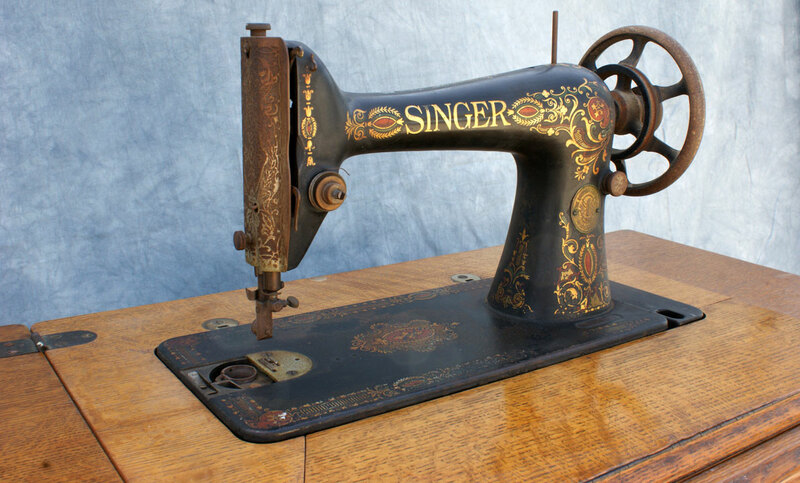 According to the The Singer Company's History Page Singer made the first practical sewing machine in 1850. (See also Sewalot.com - A Brief History of the Sewing Machine and Sewalot.com - Singer.) Singer also introduced the idea of the foot operated treadle. The story of the sewing machine parallels that of machines like the typewriter and camera. 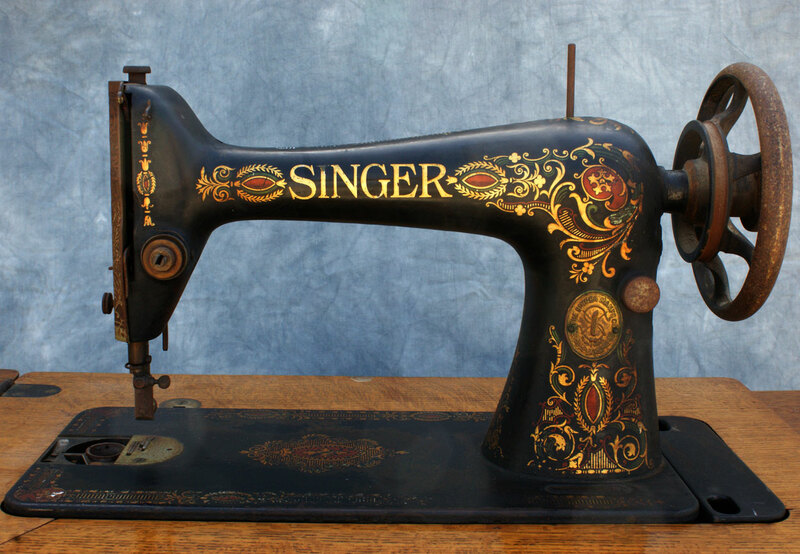 My sewing machine is entirely mechanical, but about ten years later Singer introduced their first electric machine as indicated above. By 1975 Singer introduced the first electronic sewing machine, the Athena 2000. With an electric machine, the electricity simply powers the mechanics. With an electronic machine, the electronics actually control functions of the machine. By 1978 Singer introduced the first computer controlled sewing machine, the Touchtronic 2001. While Singer is primarily noted for its sewing machines, it also produced electronic calculators and other business machines after purchasing the Friden Calculating Machine Company in 1965. (See Wikipedia - Friden, Inc.) It also produced typewriters as indicated in the Typewriter Section of My Museum - Singer. 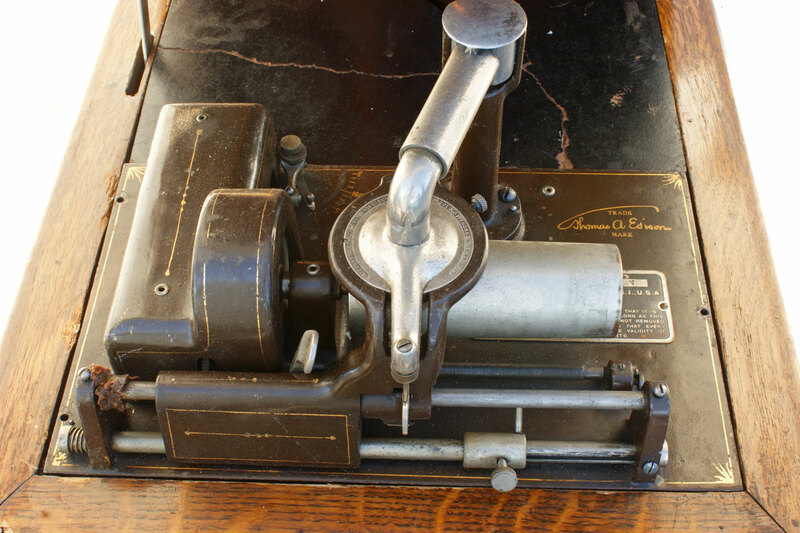 As explained there, the first commercially successful typewriter, the Sholes & Glidden, was made by Remington. In addition to guns, Remington at the time made sewing machines. Typewriter manufacture was assigned to Remington's sewing machine division. The first machines ended up with treadle bases just like the sewing machines. (See Sewalot.com - Remington.) A final interesting fact about Singer is that its headquarters building in New York City was the world's first skyscraper and the tallest building in the world when it opened in 1908 at 47 stories, 612 feet tall. (The Singer Company's History Page and Wikipedia - Singer Building.) Its status as the tallest building only lastest a year, however. In 1909, the Metropolitan Life Insurance Company Tower became the world's tallest building. The Singer Building was demolished in 1968 and remains the tallest building ever demolished by peaceful means. Tragically, the World Trade Center in New York City is the tallest building demolished by any means. Sewing machines like this can be repaired and still used. It, of course, would lack the advantages of modern sewing machines including dozens of different stitches. 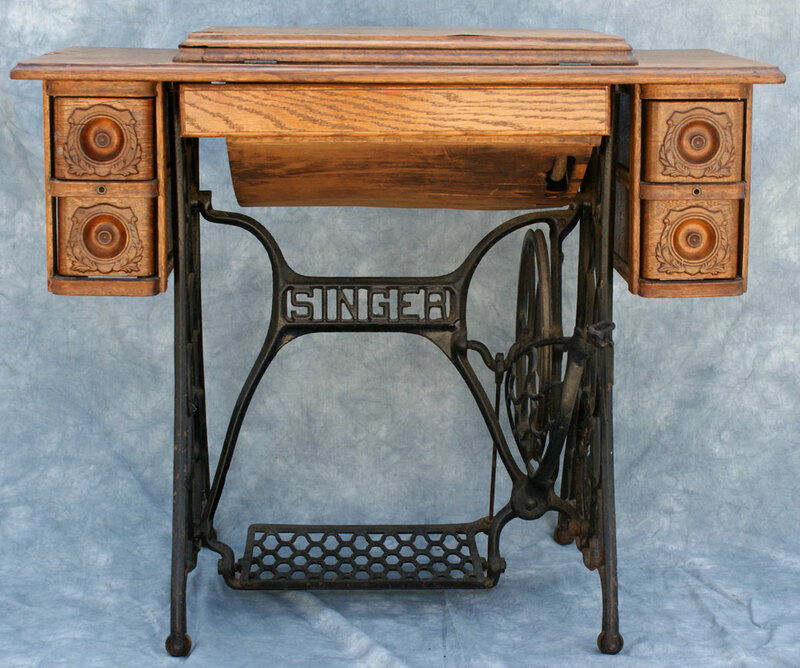 A more likely use for treadle sewing machines is just to use them as a cool looking old desk. A laptop would fit fine on top of this. Ebay has several listings for the metal base legs only. Add a top and you have a nice retro looking desk. Books are appropriate for a technology museum since language, writing and printing are some of the most important inventions of mankind. I not a "book collector" but I do buy a lot of old books. Most books are on the store shelves a short period of time and rapidly lose their value. The value of the content does not usually change as rapidly as publishers would like us to believe, however. (As can be seen below, it does change, however. Don't apply leaches for organ inflammation.) You can therefore get great deals at garage sales, library sales and used book stores. 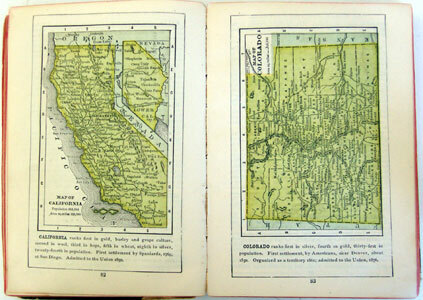 For now I have included my only two books from the 19th century. Enjoy. 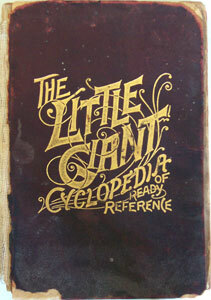 The Little Giant Encyclopedia (1881), full of useful information such as applying leaches for inflammation of the bowels, brain, kidneys, liver, lungs, stomach or throat. (pages 313, 314) (Actually, as absurd as this sounds, I learned from a television news show after initially writing this that leaches are still used occasionally in modern medicine to drain blood from damaged tissue. See, e.g., "Beyond Bloodletting: FDA Gives Leeches a Medical Makeover.") Decent condition for age. Still intact but spine coming apart. Purchased at a 2004 garage sale for about $1. 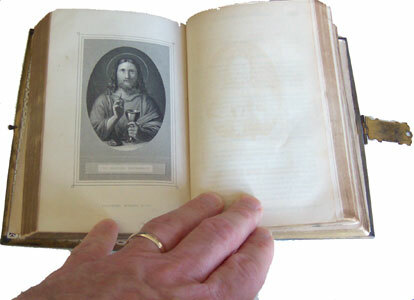 Saint Vincent's Manual (1864), "Containing a Selection of Prayers and Devotional Rosaries, Originally For Use by the Sisters of Charity in the U.S., Revised, Enlarged and Adapted to General Use." Complete or nearly complete (966 pages). Cover separated, some pages loose. Purchased at a 2004 garage sale for about $1. 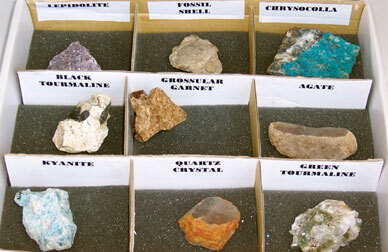 Rocks in a technology museum? Why not? 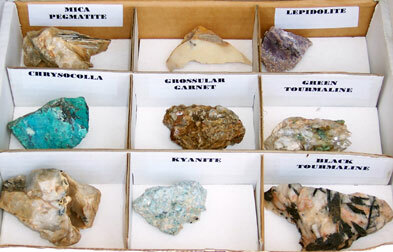 Think of rocks as part of nature's technology. 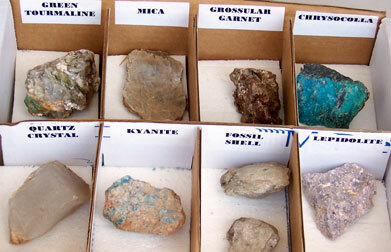 I'm definitely not a rock hound, but here are some rocks I have purchased at a garage sale for $2 per box. The labeling was done by the seller. 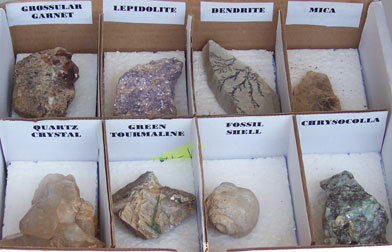 I have used some of these in teaching earth science. 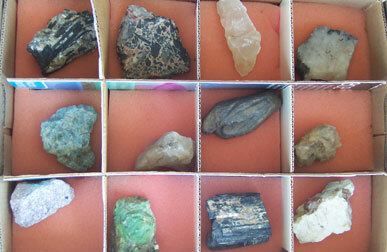 I have more from a rock shop and the county fair which I will include later.